We hope everyone is doing well! The Spring is flying by quickly this year and we can’t believe we’re already recapping this season’s 16 week Winter CSA! We are so happy and proud of this year’s CSA. 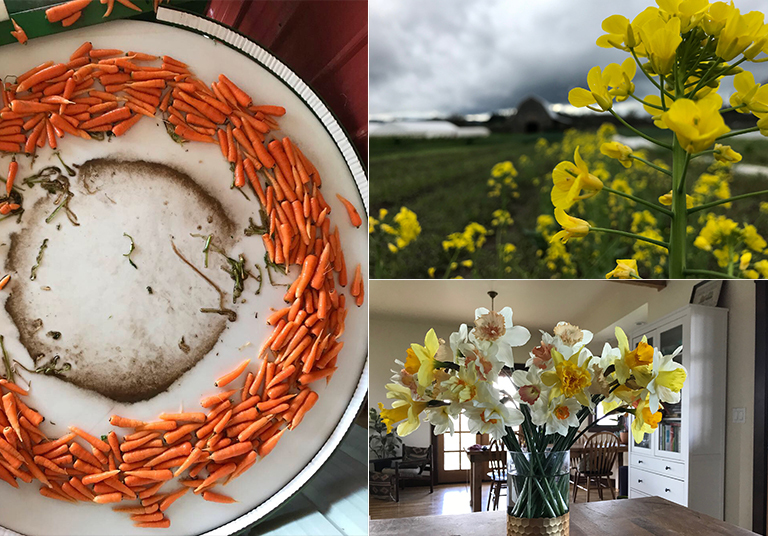 As farmers, every season that we farm proves to be an incredible journey with so many things to learn and many delicious farm grown goodies to grow. As we head into our 10th year, we’ve harvested 17,400 individual CSA shares and over 490,000lbs of produce all while feeding 1,000’s of families in our community. 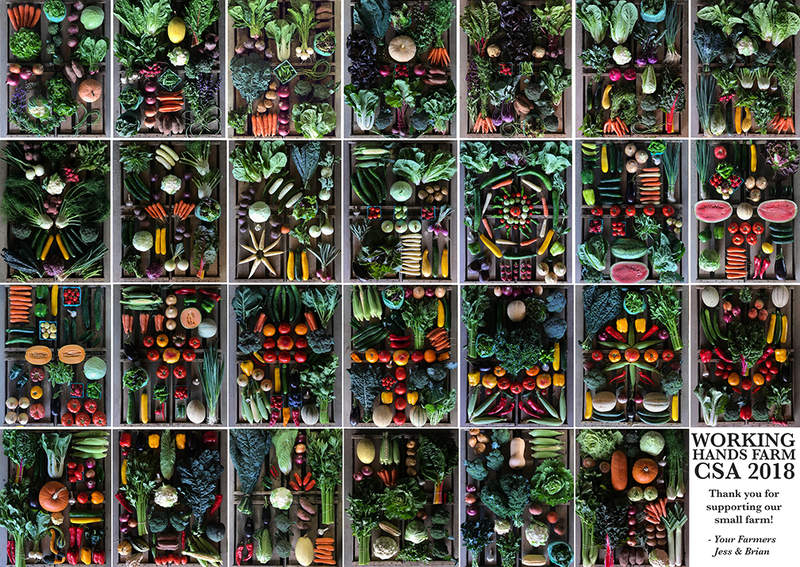 26,110 CSA shares and over 695,000lbs of produce. Winter CSA Success! Last week was the final pick up week of our fourth Winter CSA season and I know we’ve said this time and time again but we LOVE the Winter CSA!! Thank you to the 100 households who supported us through the Winter months! Be sure to check out the Winter Recap below! One of my favorite parts of Spring .. when the kale goes to seed, a planting we will go and the last Winter CSA harvest..
Spring Updates! Things have been moving right along on the farm the past month. It’s been a crazy ride trying to beat the rain that’s been filling up the ten day the last month. 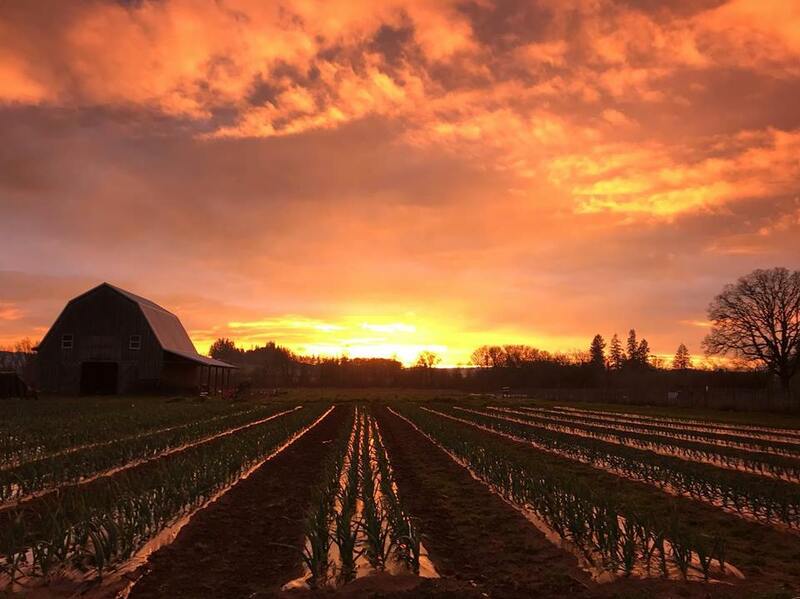 As my friend Carri from Pitchfork and Crow Farm said about farming in April, “hurry up and wait.” A lot of our friends who farm in Salem and south of there had some serious flooding the last few weeks after receiving several inches of rain. Freshly planted fields, high tunnels etc were all flooded out. Rivers were reckless and unrecognizable. Reminded us of the crazy wet Spring we had a few years ago when we had a perpetual flood on the lower acreage of our farm for the months of Feb and March and wondered if we’d ever dry out enough to plant! We seem to have lucked out this time around (mother nature is ultimately boss) and have been able to work the soil to plant and cultivate with a waiting game in between. We’ve planted so much since the end of March. The first spring kale, broccoli, kohlrabi, cabbage, chard, lettuce, beets, cauliflower, bunching onions, snap peas, fava beans, spinach, pac choi, fennel, turnips etc all made their transplanting debut. The first field carrots came up a few weeks ago and they already have their first true leaves! We planted a new field of strawberries (4,000 plants!) in addition to last year’s patch that is coming back strong. We hope to have multiple successions of strawberries – if we get any late spring rain it can do a number on the berries so it’ll be great to have a succession to mitigate that risk! 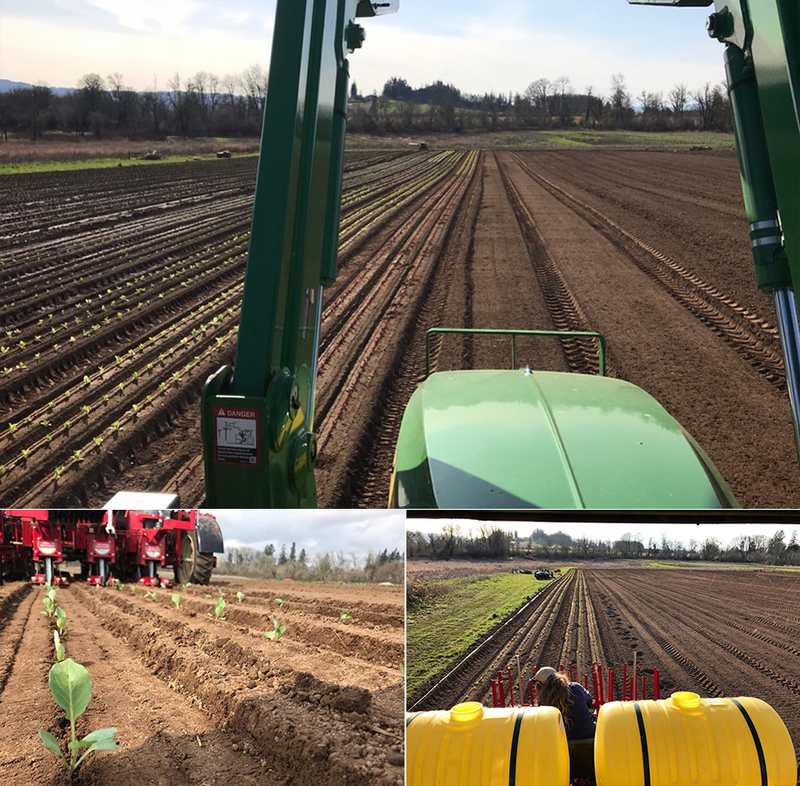 Potatoes were also planted this past week in the sunshine – over 6,000 ft! (that’s 6,000 potato plants). Fingers crossed for our best tater season to date! 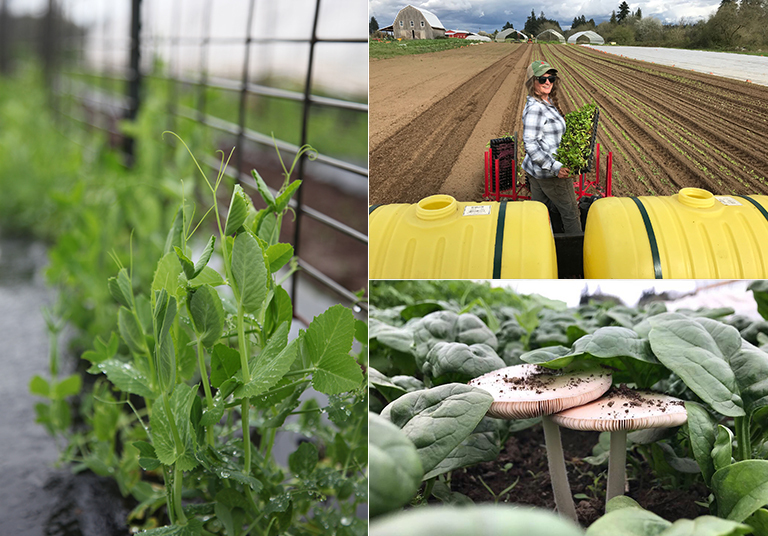 The snap peas are stretching towards the sky, transplanting and two fungis..
We’ve also managed to get in a few first passes on our cultivator the Argus Finger Weeder. The weeds can be extra competitive this time of the year especially if the soils wet and you aren’t able to get in there and weed when you need to! Luckily, we’ve had a few breaks in the weather to get out there but we need to stay on top of it to get the plants to a place where they can out compete their weedy opponents (namely Redroot Pigweed and German Chamomile). The Argus does an amazing job and it’s part of our secret to success! Brian and I can weed an acre in a day! This time of the year we have row cover to contend with (uncovering plants, moving the cover, repeat) but come summer there is no row cover and we can just breeze on through the crops! It really is an amazing piece of machinery that allows us to grow as much food as we do. One thing we won’t be weeding this Spring (for the first time ever) is garlic + over wintering onions! We planted them last October in plastic mulch and boy did it pay off (helps suppress weeds, keeps the soil warmer to promote more growth and keeps the soil nutrients from leaching in our wet winters)! It’s our healthiest and happiest looking garlic we’ve ever grown. Usually it takes us about a week to hand weed it and this year (after some maintenance during the winter months) it looks like it’s good to go until harvest in May/June. Pretty soon it’ll be throwing up garlic scapes – just in time for the Spring CSA! We’ll call it a win and will be definitely planting it this way in the years to come. 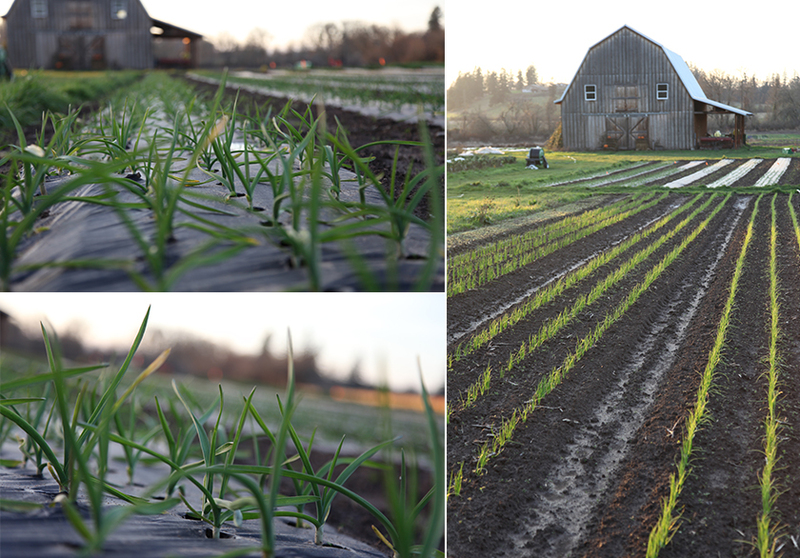 Cultivating with the Argus and this years garlic crop..
We’re getting really excited for the new season to begin! 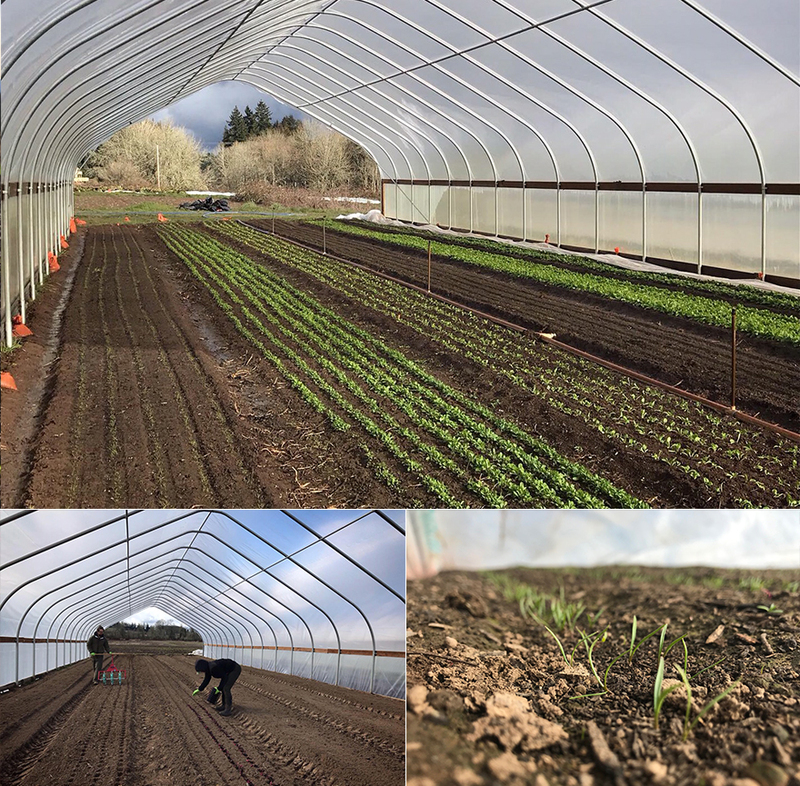 Things are really taking shape over here and we have some more planting, mowing, seeding, cultivating and tilling to do over the next few weeks before it begins. It’s the most important time in the season right now where we’re gearing up and charging ahead planting all the things and getting ready to feed 200 households for 7 months of the year! Whoop whoop! The Winter Bounty Recap! We started our Winter CSA journey on November 27th and we made it all the way to the middle of April! Our expectation for the Winter Shares was 8-12 items (dependent on weather) in each weekly share. 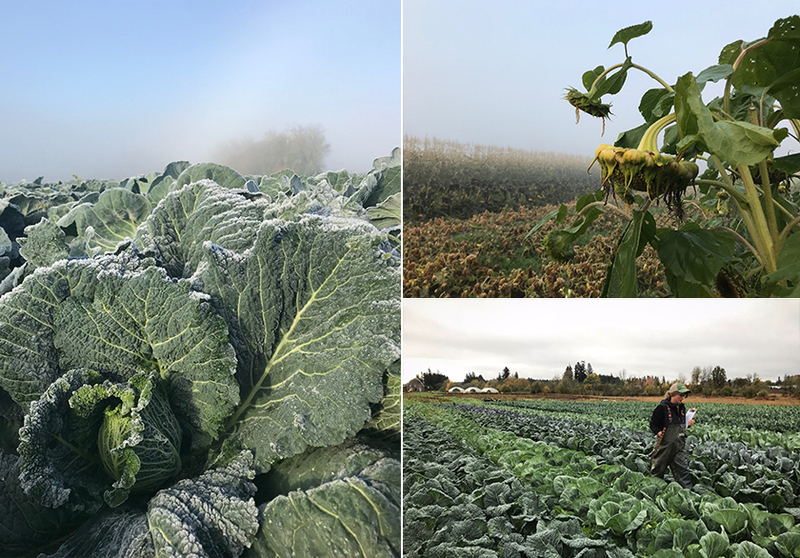 Over the course of 16 weeks, Farmer Brian and I have grown, harvested and distributed 44,800lbs (1,400 shares) of winter produce with 15-17 items in each weekly share! 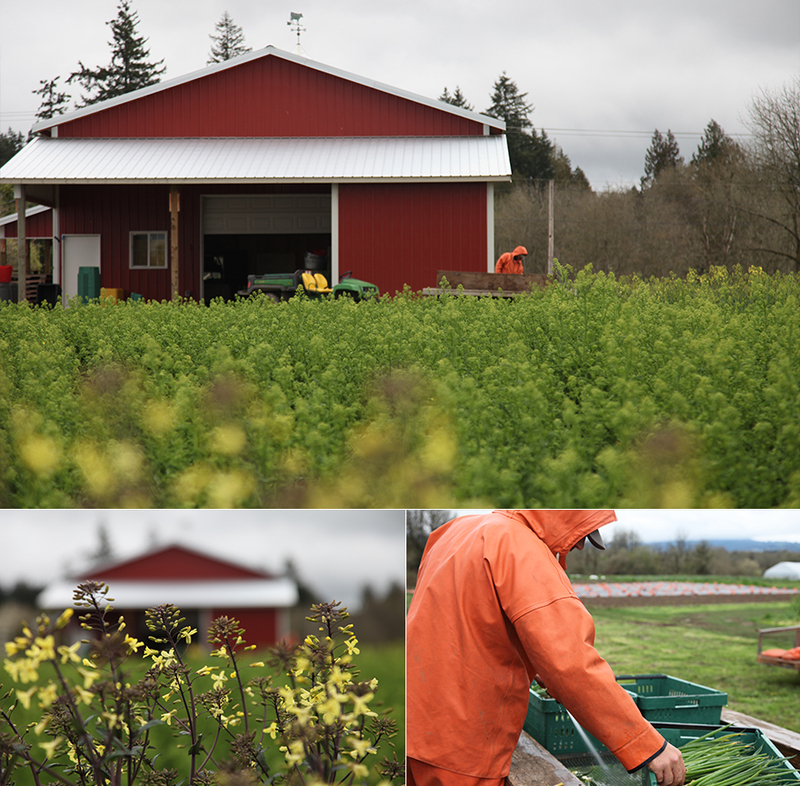 Farmer Brian washing and packing up produce and the kale rapini going to flower. 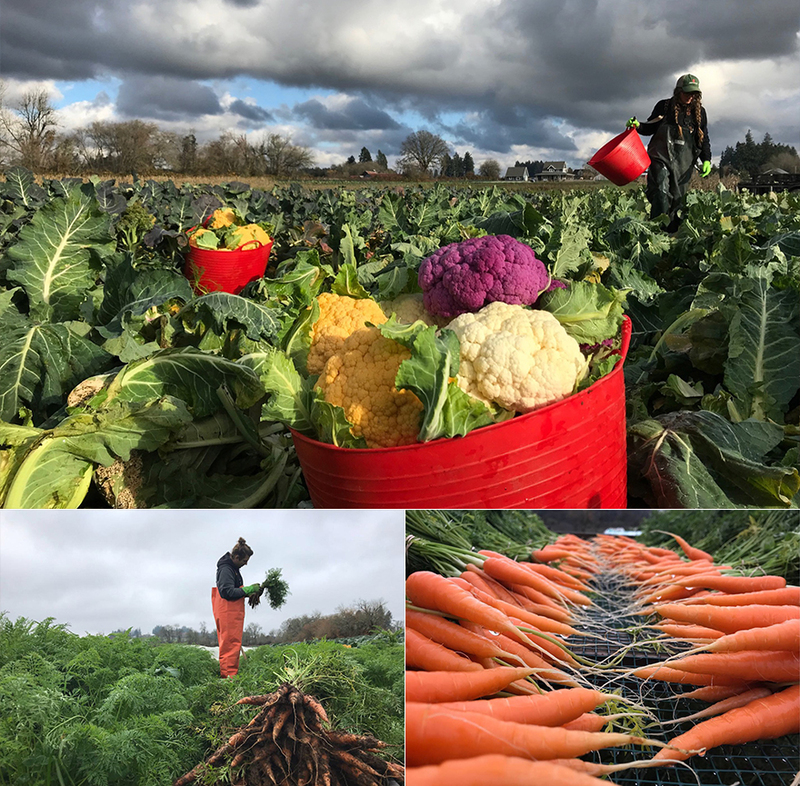 We were also impressed with the variety of veggies we harvested through the winter months – most weeks we had more fresh picked produce than storage veggies which is amazing (even in the coldest and darkest of winter days)! To top it all off, it was an average of 535lbs per weekly share which comes in around $1.48/lb of produce. So many different kind of goodies in the winter shares…Arugula, beets, broccoli, brussel sprouts, cabbage, carrots, cauliflower, celeriac, celery, cilantro, cipollinis, collards, garlic, greens mix, kale, kalettes, kohlrabi, leeks, lettuce heads, onions, herbs (thyme, oregano, sage), pac choi, parsley, purple sprouting broccoli, pumpkins, radish, rapini, radicchio, romanesco, rutabaga, scallions, shallots, spaghetti squash, spigarello, spinach, sweet potatoes, swiss chard, turnips, winter squash and more! 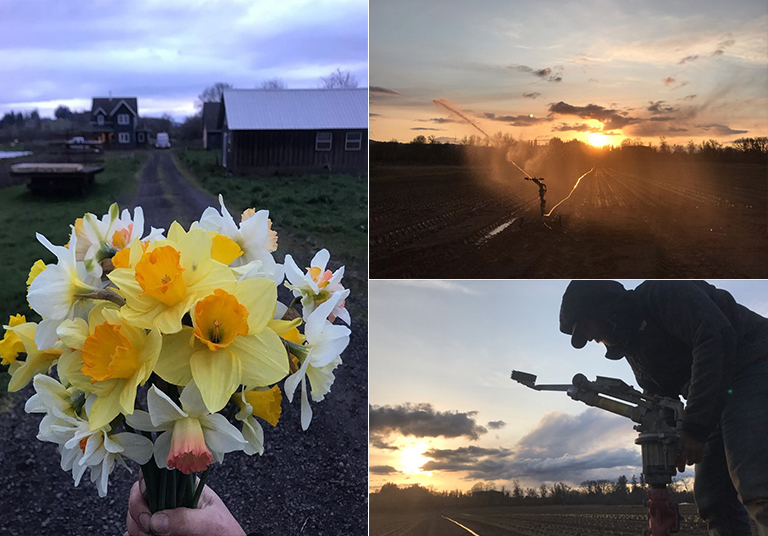 We transplanted the first tomatoes of the season, the strawberries sprouting their first leaves and the orchard is flowering..
Farm fresh can’t be beet, overwintered swiss chard brightens up the field and Farmer Jess & Rob planting potatoes.. This Winter was definitely more mild compared to last year. We had some cold stretches (with lows around 18), windstorms and rain but we seemed to avoid the heavy snow and extra frigid temps (15* and lower). We felt prepared for just about anything and as we become more seasoned that feeling of preparedness keeps growing. 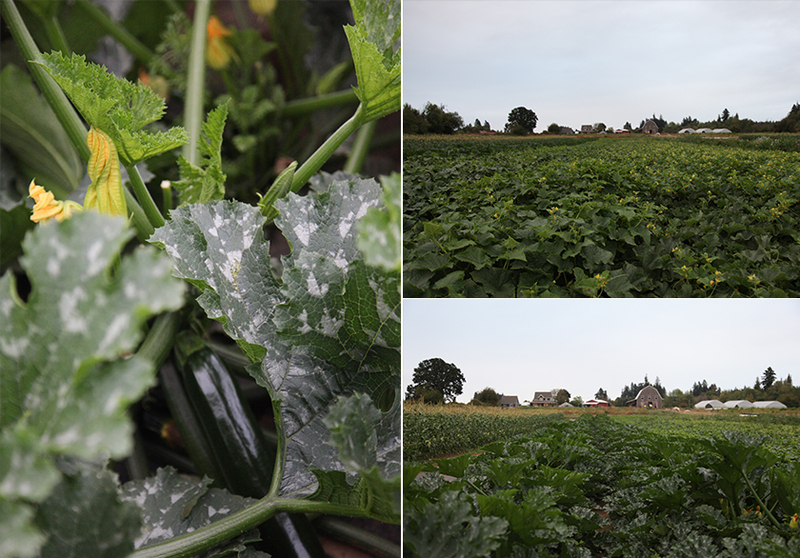 At the end of last fall, we were able to put up many tons of carrots, potatoes, onions, garlic, sweet potatoes, winter squash and other root crops and grew plenty of PSB, kale, leeks, spinach, cabbage, brussels, kalettes and other greens to keep all the shares fresh and varied. It was our most successful winter CSA to date (look at those numbers above) and we’re riding that high as we head into the Spring, Summer and Fall growing season. 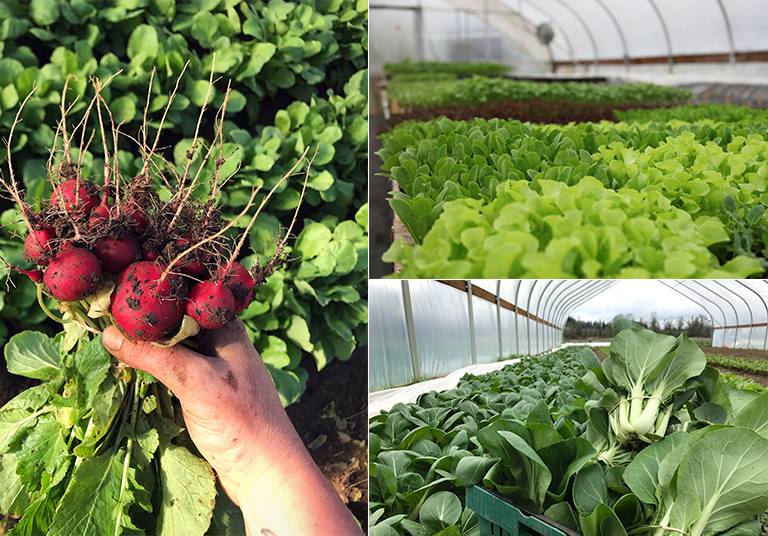 Spring radishes, harvesting pac choi and the babies looking good in the propagation house.. Thank you to everyone who has spread the good word about the upcoming Spring, Summer & Fall CSA! The majority of our new members this season are from word of mouth so THANK YOU! We have just a few shares left so if you have a friend, family member, co-worker etc that’s interested now is the time before we close down sign ups! Carrot art straight out of the barrel washer and signs of spring all over! Reminder: First CSA payments are due by this Monday, April 1st! Check out the email ‘Reminder: First CSA Payment Due by April 1st’ for more details! We hope you are all happy and well and enjoying the first week of Spring! 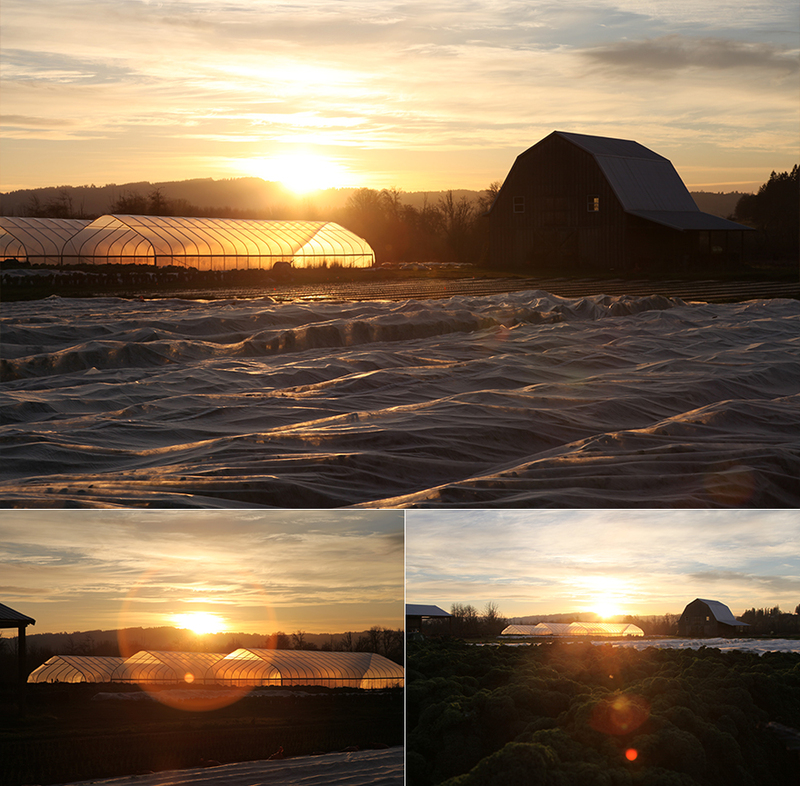 Things have been chugging right along over here on the farm and as the days grow longer we’ve been keeping pretty busy. 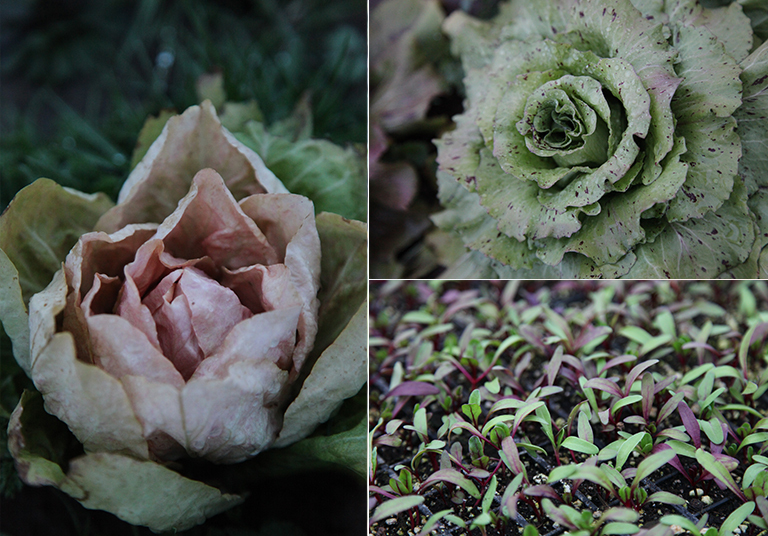 Getting back into the garden after winter is one of the most exciting times on the farm and we love it! My happy place in the propagation house. Feeling good about these hard plastic trays we invested in this year. 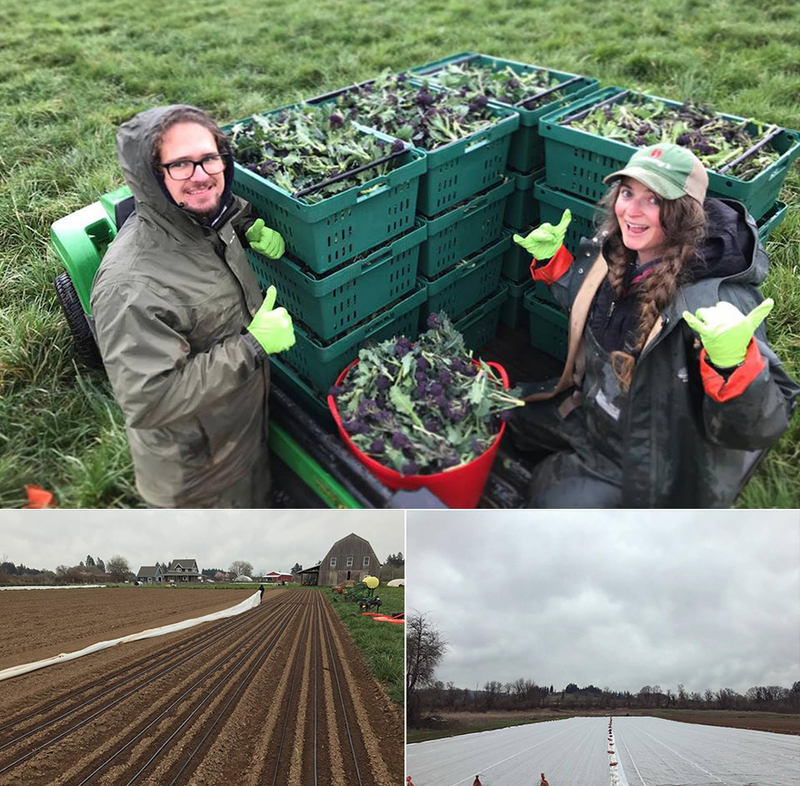 Our first big field planting of the season happened last weekend during that lovely dry stretch (over 13,000 plants and ½ acre of crops). And oh how lovely it was (hello sun on my face…)! The first spring kale, broccoli, kohlrabi, cabbage, chard, lettuce, beets, cauliflower, bunching onions, snap peas etc all made their transplanting debut. The first field carrots were seeded a week ago and we’ve got our eyes on them for any signs of germination so we can flame weed before they break the surface. Fava Beans will be direct sown into prepared beds later this week! That little bit of sunshine has us wanting more! All our fingers and toes are crossed for more sun in the 10-day (although it’s looking a little wet). We’ve got some ground prepped and some ground cover to lay down for strawberries. So come rain or shine this week and next we’ll be planting lot more strawberries! Depending on how much rain we get, we really need like 3+ days of sunshine in a row to dry out all the fields. So far it’s been a much drier Winter/Spring than the record breaking one of 2017 which means we’ve been able to work the soil a lot earlier this season! We’ve had a fair share of sun and it was even up in the 60’s on a few days. The sun and warmer weather sure does put a pep in ones step and it feels good to out working in the fields. 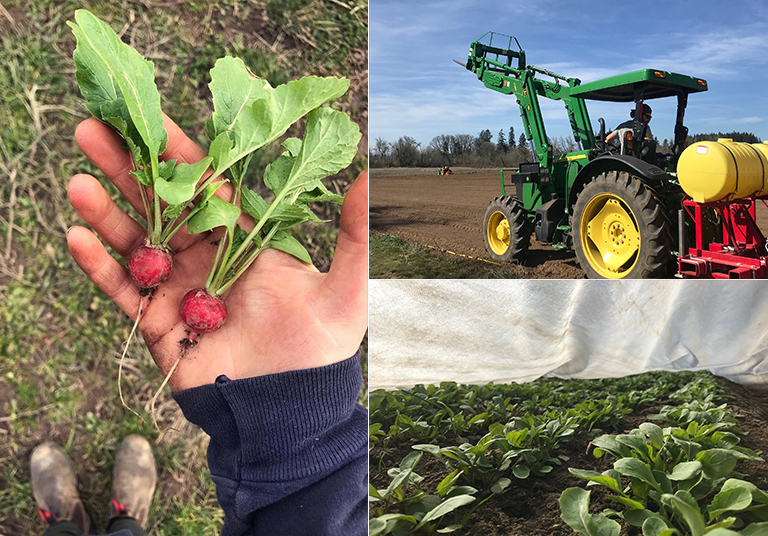 The high tunnels that were once full of Winter CSA goodies have been flipped (tilled) to grow Spring and Summer CSA veggies… we were able to plant a round of early potatoes, beets and greens just a few weeks ago. 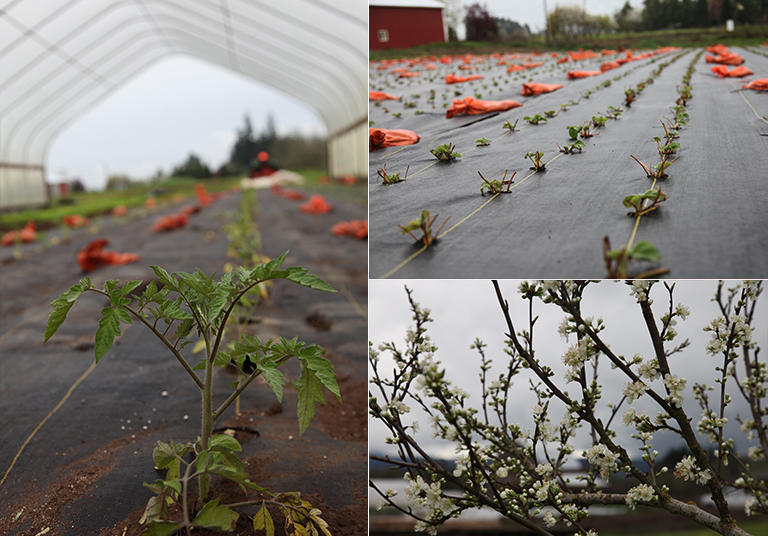 In just a couple of weeks we’ll be planting our early tomatoes in the high tunnel! Whoo hoo! Soaking in the sun and getting the first transplants of the Spring season in the ground! Brian and I make a great team. Field prep is the big thing that needs to happen this time of year… Spring marks the time in the season where we can finally get out there to lime, fertilize and compost the farm. Where we mow old crops, pasture and cover crops and begin the transition for planting new crops. The past few weeks Brian and I have divided tasks in order to take full advantage of our weather windows. While I was busy harvesting for Winter CSA Brian was turning over new ground, mowing, tilling and prepping beds so that we could have the opportunity to plant. It was awesome having another hand from Rob who’s been working hard here all winter long. He jumped on the tractor to till and help prep beds as well as helping with harvest and getting a jump on some propagation house seeding. Having the ability to seize the moment when you have it is amazing. The machinery we’ve purchased over the last 4 years + the systems we are dialing in as we gain more experience and become more comfortable and proficient, so, we’ve been able to take full advantage – within reason of course as we’re only human – of the drier weather! . The soil itself is also becoming better with time (from the amending etc) which makes it easier to work at the beginning of the season. Winter CSA harvest included 150+ lbs of Purple Sprouting Broccoli! Just a few pick up weeks left in the season. Covering up babies in the field. Prophouse Chronicles. Earlier this month we woke up to so many pepper seedlings in bits and pieces in our propagation house. We thought it was mice, set traps and nothing. Checked all day long and would only see more damage in the morning hours (between 730-830 am when the doors weren’t open). Setup bird net, dissected trays, watered before 2pm, researched and consulted some friends. Felt insane. Why…?! We finally found out: Brian happened upon a little bird in there early in the morning feasting on some tasty cotyledons. We have no idea how it had been getting in there but you better believe we sealed off any tiny places where the rock met the ground and covered the babies up with row cover over night. Although the damage hurt we seeded them early enough that we were able to order more seed and the mystery has been solved. No matter how many times we do this there’s always something new to navigate! Onwards and upwards! One of my favorite moments of Spring.. the first Narcissus! Turning on the irrigation in the field for the first time in 2019! No turning back now! So, while we’re waiting for the next sun break, we’ll be busy clearing the rest of the fields.. removing drip tape, row cover and sandbags from the winter crops. We have a few bulk crops to harvest and get out of the field and will hopefully get that done over the next few days. Inside there is plenty of seeding, office work and crop planning to do! There’s still a lot to be done but it feels great to get them done in these big pushes. We have a pretty big list of seedlings to start this weekend (which is great timing with all the forecasted rain) as the next succession of planting has arrived! 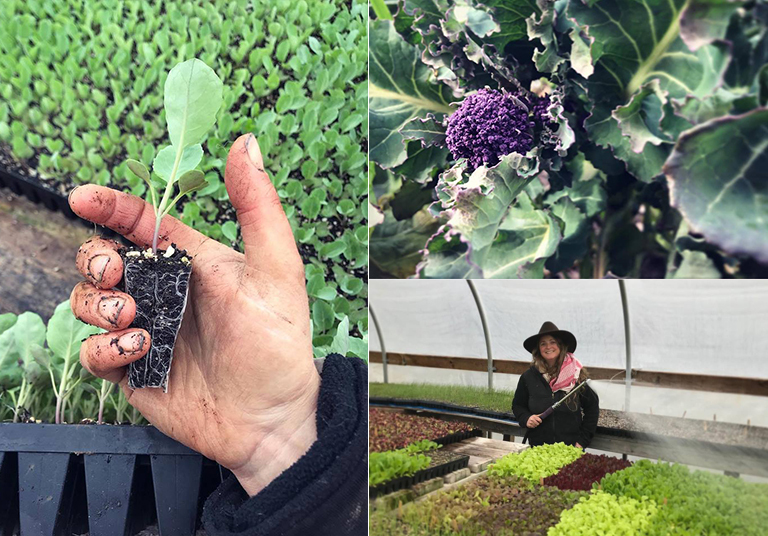 Hundreds upon hundreds of trays have been filled and seeded over the last few months… most recently celery, celeriac, our next round of broccoli, beets, chicories, greens, bunching onions, peas, basil, herbs, lettuce etc. It always feels really good to get some of the major crops (i.e. onions, celery, tomatoes, peppers, eggplant etc) that we only plant once a year. After they get seeded into trays they go into the germination chamber where it’s a cozy, stable 80* with high humidity which gives the seeds the best chance at germinating. Once the seedlings have germinated/start to emerge the trays are moved to the propagation house (that is passively heated by the sun) where they’ll continue to grow until they are planted later this Spring. So that’s another place where we’ll be this weekend.. seeding our little farmer hearts away! 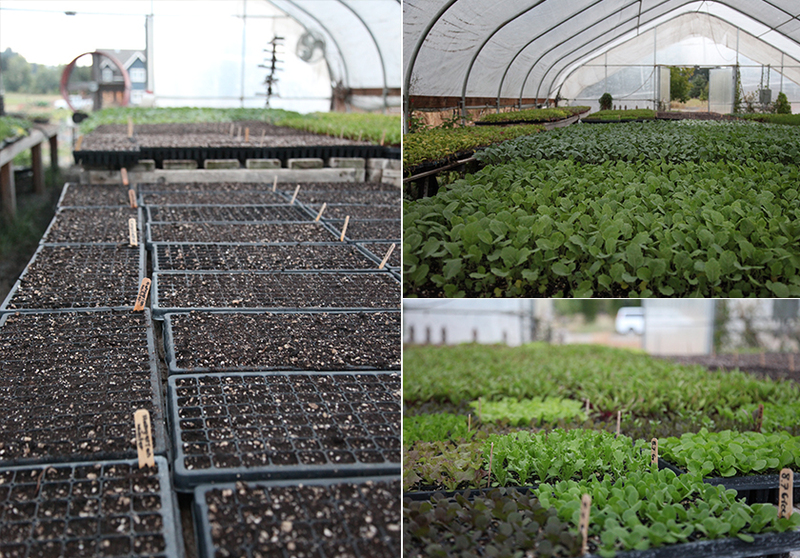 You know it’s Spring when you see… The first baby radishes, the first steel in the field and lots of green out there! Know your farmers, know your food! 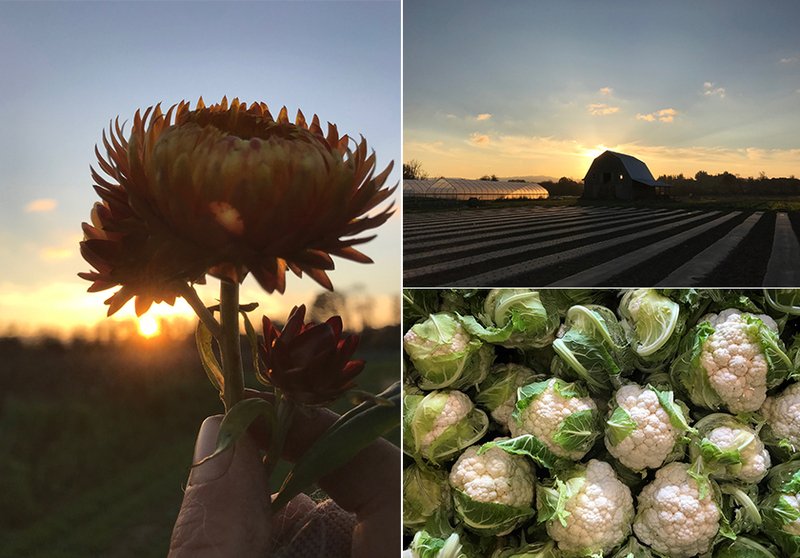 The Spring, Summer and Fall CSA is drawing near and we have less than a few dozen shares available for the 2019 CSA season! Fun Note: We’ve also had more return members than ever before (more than 75%) which is pretty darn exciting! 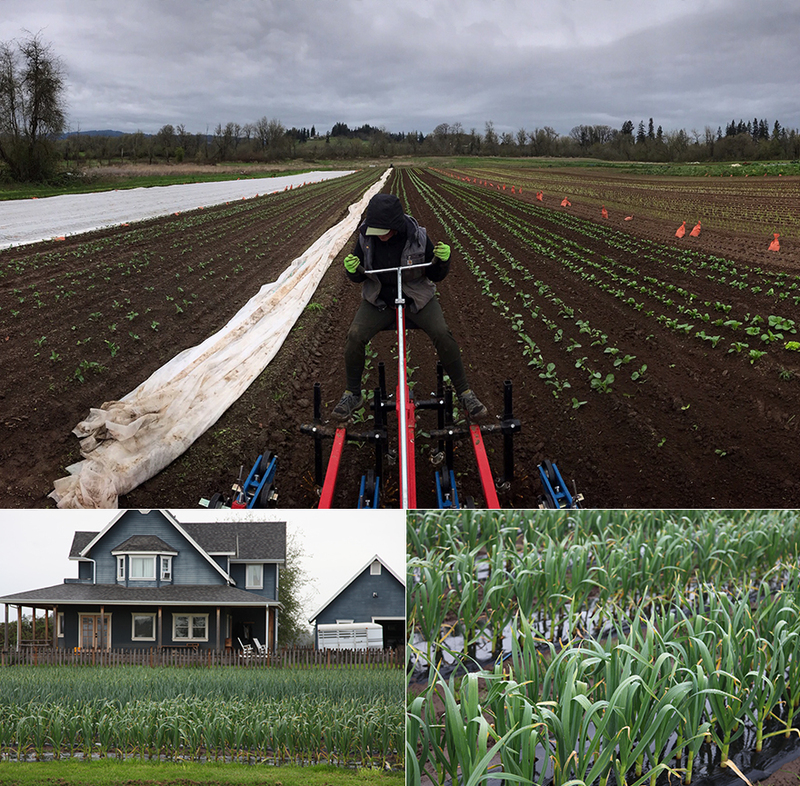 We can’t wait for the 2019 growing season to start! Thank you to all of our amazing CSA members both new and old who have signed up for the 2019 Spring and Summer CSA season! Purple Cape Cauliflower.. more like a broccauli! 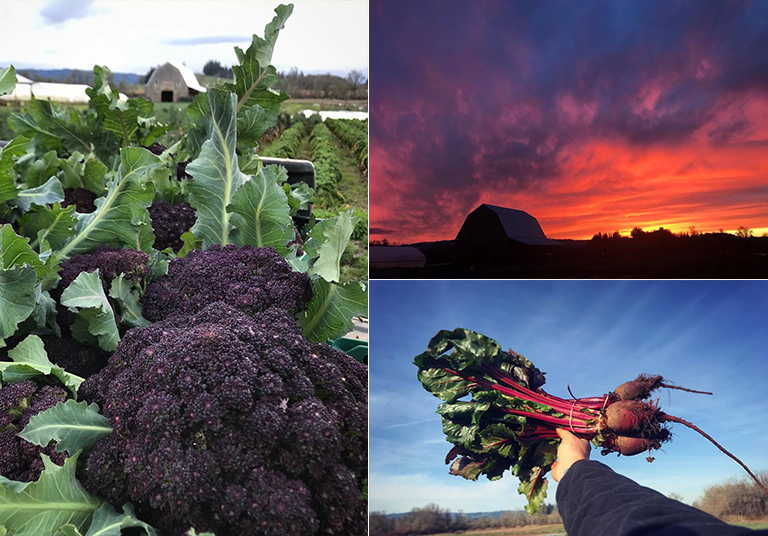 An amazing sunset and freshly harvested beets..
Winter CSA Reminder: Winter Weekly Share Members + Winter Bi-Weekly Share Members: we have just 2 WEEKLY pick ups left and 1 Bi-Weekly pick up for the Winter CSA Season. 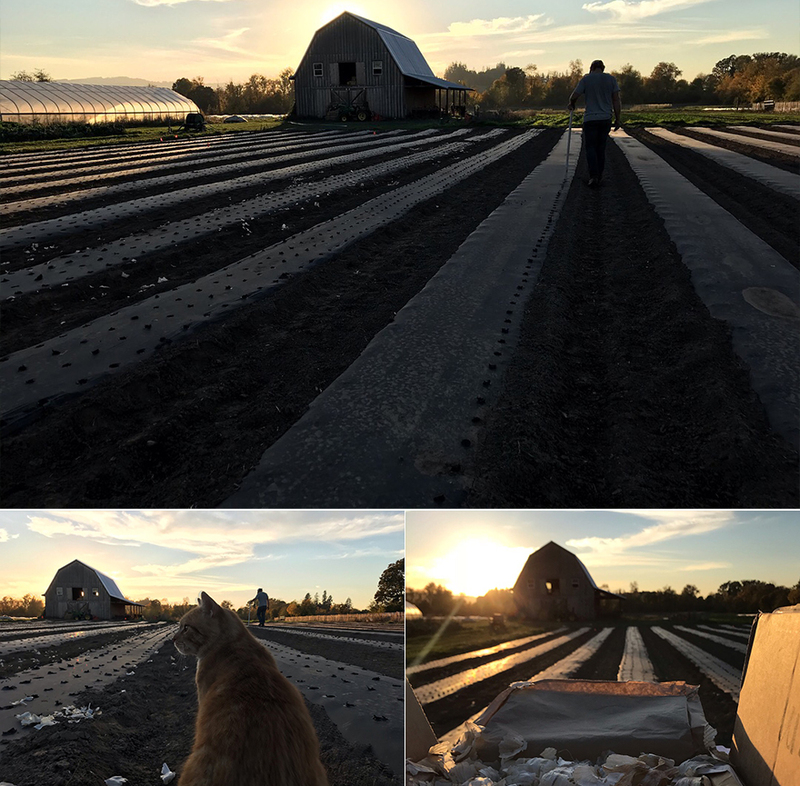 It’s been an amazing few weeks on the farm… between the beautiful Winter CSA shares we’ve been harvesting, Oliver and Buddy our newest farm kitties caught their very first voles this week, getting so many crops in the ground and continuing to push many things forward. Everything is awesome! Be well, do all the sun dances and root your farmers on! It’s officially game time! Welcome back! 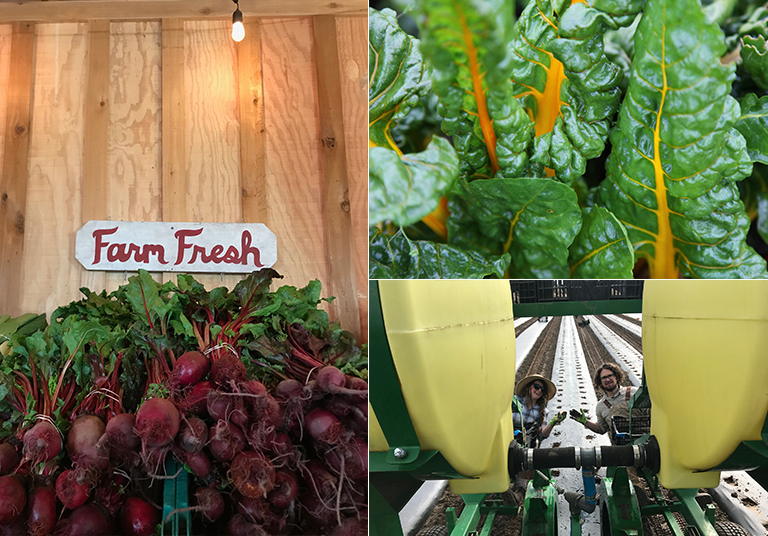 After a week on vacation and a few days at the farmer to farmer exchange in Breitenbush, our hearts are feeling full and ready for the season ahead. 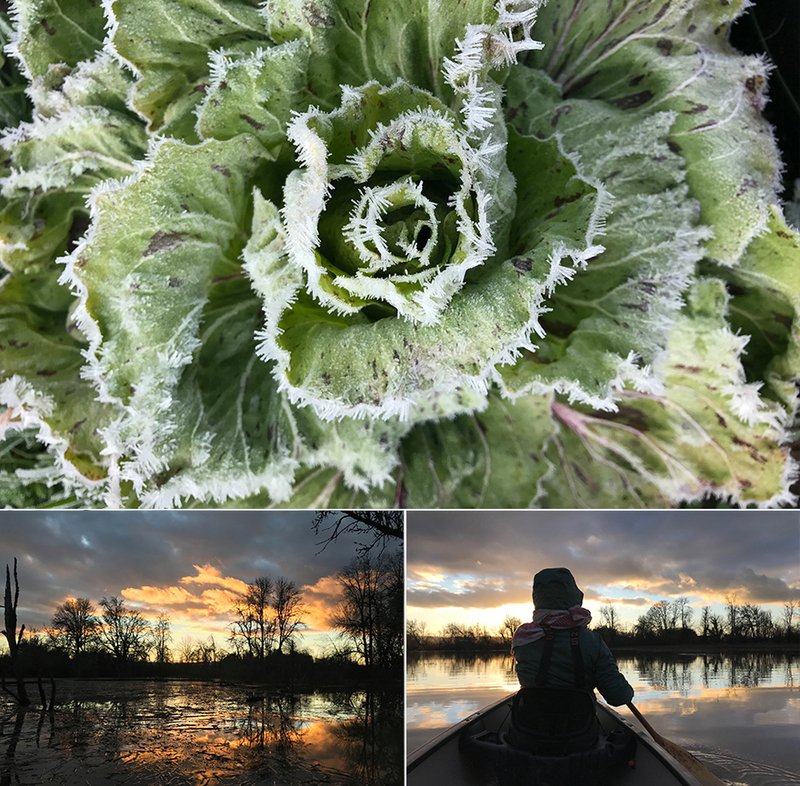 (more about the vacation and winter CSA updates below…) It’s been great to leave the farm, have a little adventure and gain some perspective! We are truly feeling refreshed and inspired and ready for the season ahead! We are also so happy to be back and eating homemade farm fresh food again! The Celtic Festival, “Imbolc” was on February 2nd which is the exact halfway point between the Winter Solstice and the Spring Equinox. Which means the days are getting longer and a new growing season is upon us! It feels more and more real with every passing day. Now we just have to be patient and wait for the sun to return! 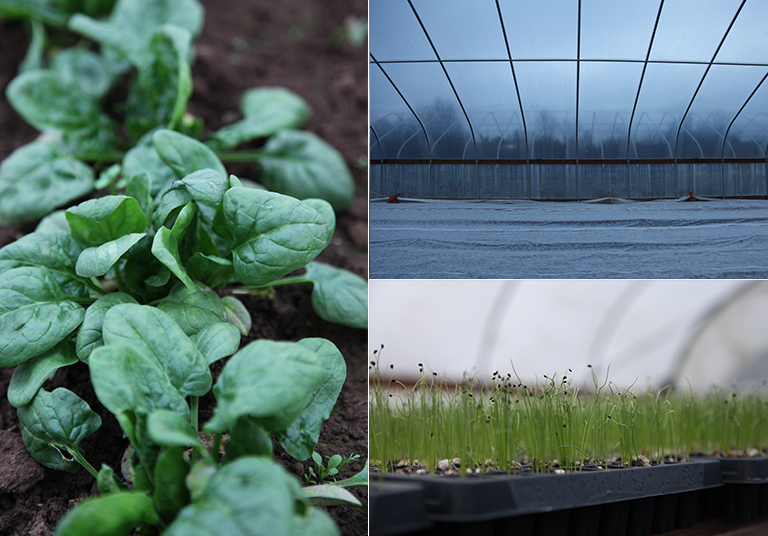 Classic chicory move growing through the row cover and lots of beautiful seedlings in the propagation house! Update! 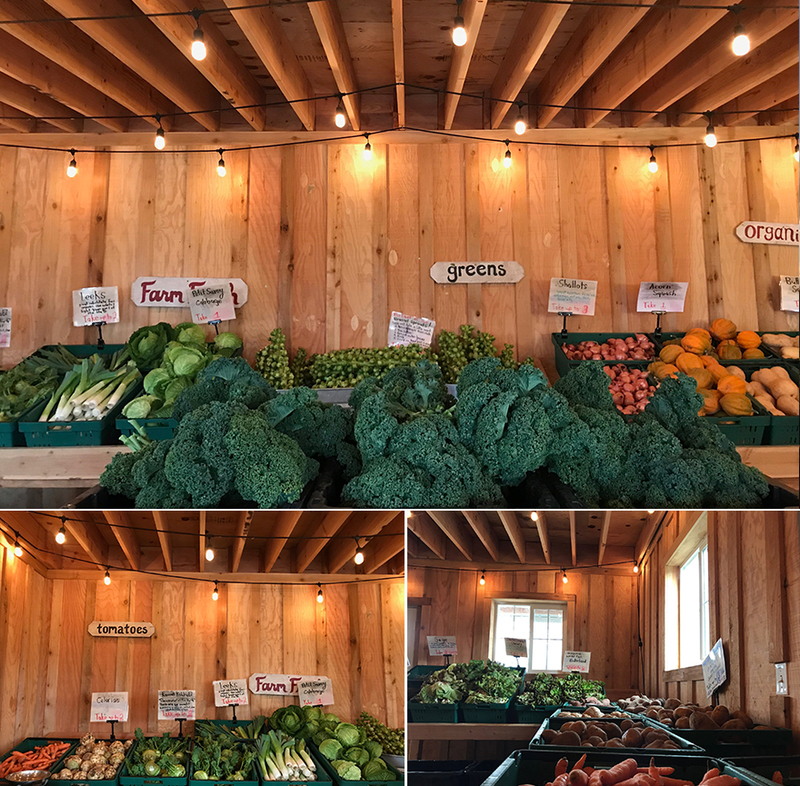 Our Spring, Summer & Fall CSA is 3/4 of the way full and we’d love to have you back for the 2019 CSA season. 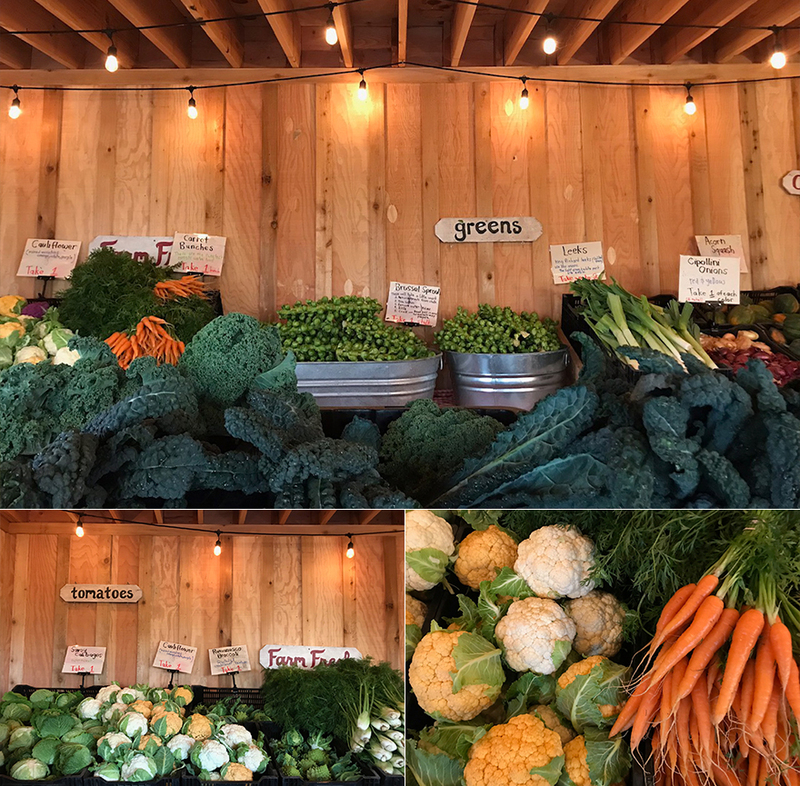 Join us for the freshest and most delicious veggies you can buy. Please pick us, Jess and Brian, to be your farmers this upcoming season. Check out our website workinghandsfarm.com/csa for all the details! Can you believe we’re halfway through the Winter CSA season? Just 7 more pick ups to go after this week! Our expectation for the Winter Shares was 8-12 items (dependent on weather) in each weekly share. Over the course of 8 weeks we have had 15-17 items in each weekly share. 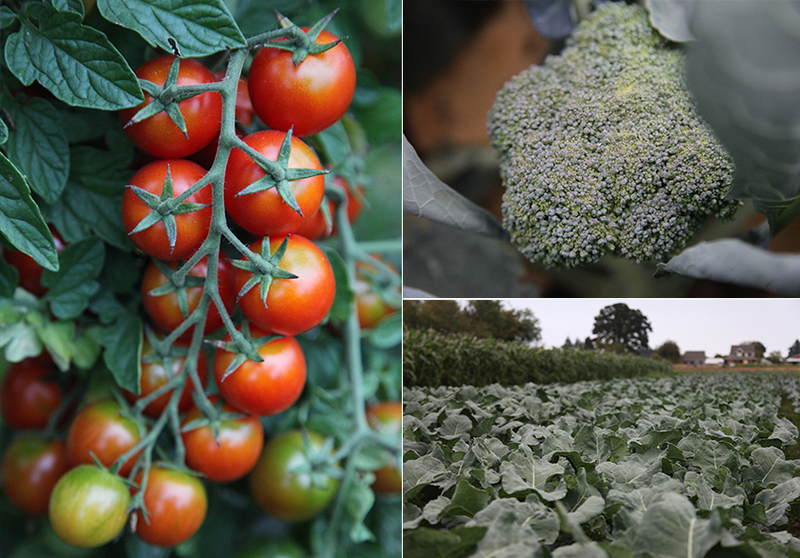 We have also been impressed with the variety of veggies we have harvested through the winter months – most weeks we had more fresh picked produce than storage veggies which is amazing (even in the coldest and darkest of winter days)! 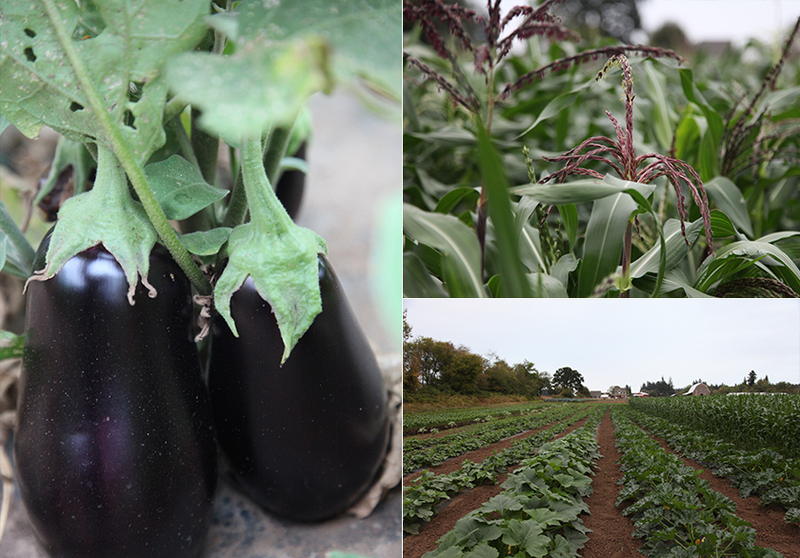 So far we’ve harvested 270lbs of produce per weekly share (21,000lbs+ total)! And are looking forward to the remaining 7 weeks of winter goodies! So… it took us 8 years to get off the farm and take a vacation (or go anywhere for more than a few hours) but we finally did it! We spent the first week of February exploring Kaua’i and it was magnificent (you can check out a few pictures here). We hiked, we sailed, we swam and we surfed. And most days the hardest decision to make was which direction to walk down the beach. We are feeling rejuvenated and are ready to get back to farming and back to work! A big thank you to our amazing friend Becca for taking care of the farm while we were gone. It is not an easy feat and she did a spectacular job! A funny and sweet thing happened while we were away. Back in 2012, one of our CSA families left a big impression on us the first season Brian and I farmed together and they ended up moving the following season. To our surprise our paths crossed again unexpectedly in Kauai and we joked that our CSA members go along way to find delicious produce. We love feeding our CSA members the best possible vegetables and are feeling so pumped for the season ahead! Don’t be dull, be dazzling! Afternoon light on the prop house and canoeing around the annual pond..
One of our personal mantras going into 2019 is following through. For years we’ve been saying we need to leave the farm, to take a day off during the week and start saying ‘yes’ to more things that aren’t solely farm related! In the last year, we’ve definitely been better about putting limits on our workdays, carving out more time for friends and family, and are still working on the day off.. Deciding to add two floating vacation weeks to the Winter CSA was part of that goal. The plans might have been last minute (!!) but we followed through on actually taking the vacation weeks. We truly feel refreshed and rejuvenated and it felt good to exercise those muscles (the R & R ones). We made the most of our days and took advantage of the fact that we were still on Pacific Time. We were up before the sun, taking in hikes and exploring so many different beaches and flora and fauna (I think we were averaging 5-8 miles per day). We both loved it. We admired the coastline and even thought it reminded us of Oregon.. except that you could swim comfortably 😉 We also remembered how well we travel together. As Brian likes to reminisce/joke.. when we first met our first date was a work trip to Uganda for 3 months and there was an ease about the two of us working together even so far away from home. It was wonderful to tap back into that and just be Brian and Jess. We’ve been doing that with much more frequency this year and it feels great to follow through and head towards a goal of better balance. It helped that we hardly had to think about the farm at all. Thanks to Becca, our amazing farm-sitter (and Rob too) the farm stayed afloat! The systems and protocol we have (and are constantly) implementing really pay off when the farmers are away! 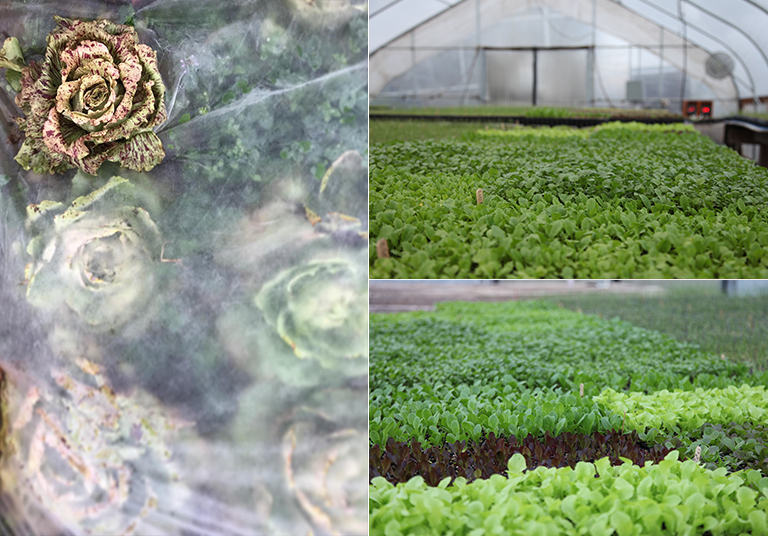 While we were away there was one noticeable difference upon our arrival, our original high tunnel poly ripped during one of the big windstorms and took sail. It’s been on there for 5+ years (usually poly only lasts for 3 seasons) so we got great use out of it and were planning on replacing it this season anyway… ol’ mother nature gave us a nudge and even helped to take some of it down. We hope to reskin the tunnel this week and get it planted with late spring crops for the Winter CSA. 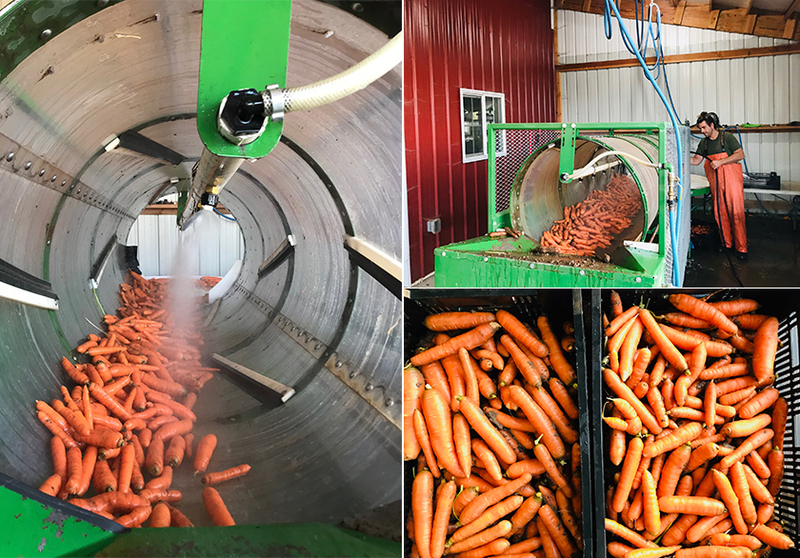 In our second high tunnel we seeded the first carrots of 2019 last month as well as another round of arugula. They started coming up while we were away (hurrah!) and if all goes well, the carrots should be ready for the first Spring/Summer CSA pick up in May. 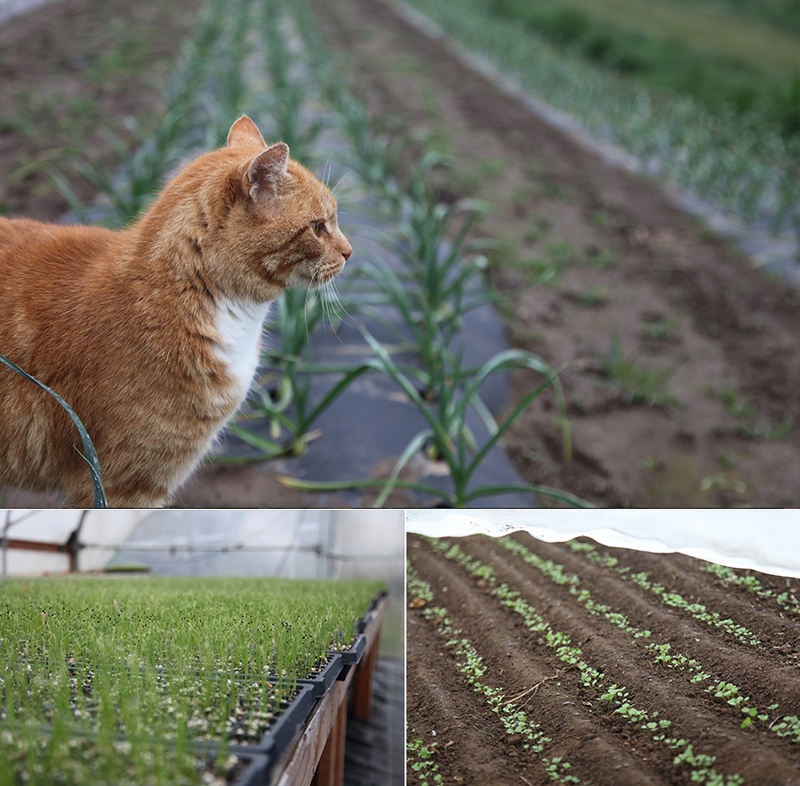 We have plans of weeding two of our 3 high tunnels over the next week that currently house some spring greens for Winter CSA – lettuce, spinach, arugula, radish, bok choy, parsley, cilantro etc. 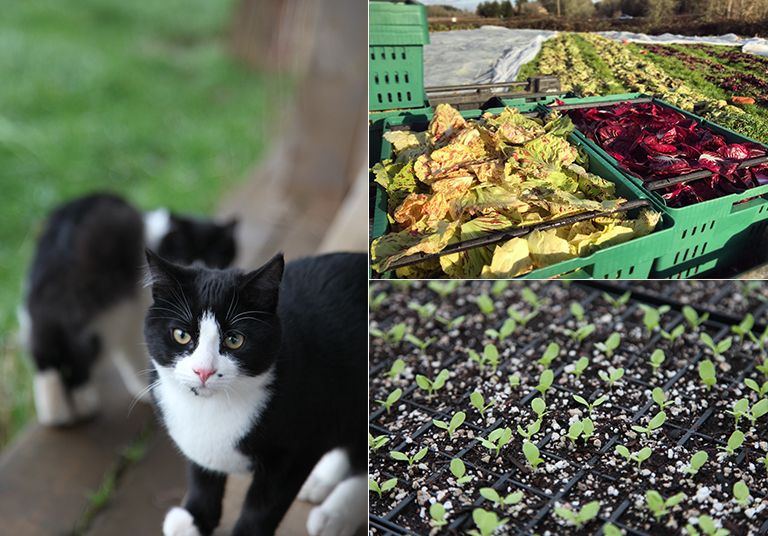 It’s so nice to see so much green this time of the year… chicories and beet seedlings forming their first true leaves..
We have two new farm kitties – Buddy & Oliver, harvesting chicory mix and baby lettuces! Speaking of rivers and streams… also upon our return from the conference (and after several inches of rain in just a few days) we were greeted by our annual flood (after a few weeks of rain and rising ground water) where our “said unnamed creek” meets the Tualatin River. We were wondering if it’d happen at all this winter as we usually we would have had several floods but this is the first time all winter that this low area has flooded! I love knowing this piece of land the way that we do. The flood is already receding but Brian and I enjoyed a nice canoe ride around the annual pond and down the tualatin. I like making these notes because each season and year is unique (and it helps me remember things more clearly) especially when I go back and read what the previous season was like at this time. From the field updates! 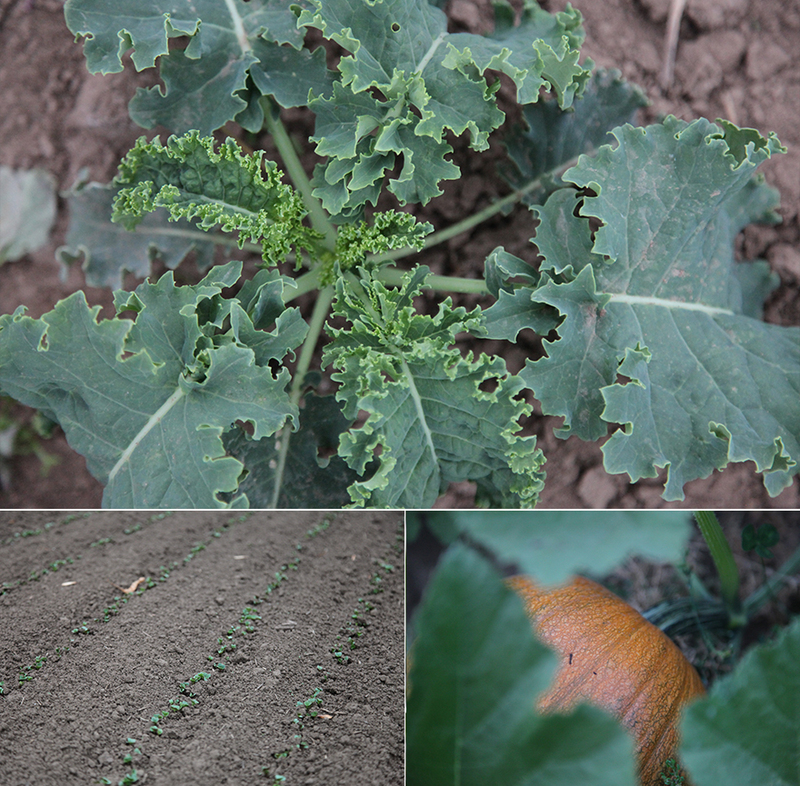 Brian and I went on a crop walk over the weekend and spotted the first Purple Sprouting Broccoli heads. For those of you who ask, ‘what is purple sprouting broccoli?’ They are a cousin of regular broccoli and look a bit like broccolini. They are a delicious treat only grown in the late winter months here in the maritime NW. It’s traditionally grown in the UK. In colder winters they have been hardy down to 10*. We love and appreciate PSB because they start to produce at the time of the season when everything else is tired, starting to go to seed etc. Most varieties don’t start producing until 180-220 days after transplant (that’s 6 months or more!! 7+ months if you included their time in the greenhouse as seedlings!) which is incredible. They are a delicious mainstay of the late winter/early spring food supply and for that we are ever grateful. The first buds are just coming on so they are pretty small this week but we are hoping they will make an appearance in the Winter Shares in the next week or two! The plants themselves look great with a ton of baby sideshoots developing for later picking! We also spotted the first Purple Cape Cauliflower with their tiny little buds in the center and a new variety of kalettes that are coming on! We love having fresh harvested produce in the shares especially as we near that funny transition time of Winter and Spring. Baby leaf spinach, the view of the high tunnel that lost it’s poly over break and onion seed tops! That’s all from the farm! We hope you all had a wonderful holiday weekend and are enjoying the Winter bounty. Fingers crossed it’ll be an early Spring! We’re really looking forward to the season ahead and sharing the bounty with all of you! Keep spreading the good word about the CSA! 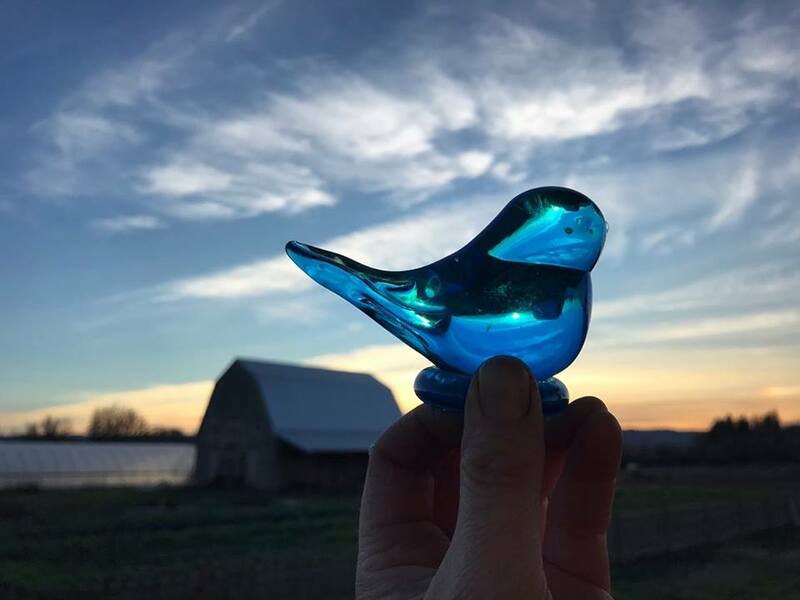 Growing up Brian’s mom called this the bluebird of happiness… Here’s wishing everyone a bluebird year! We hope you all had a healthy, happy holiday and New Year! 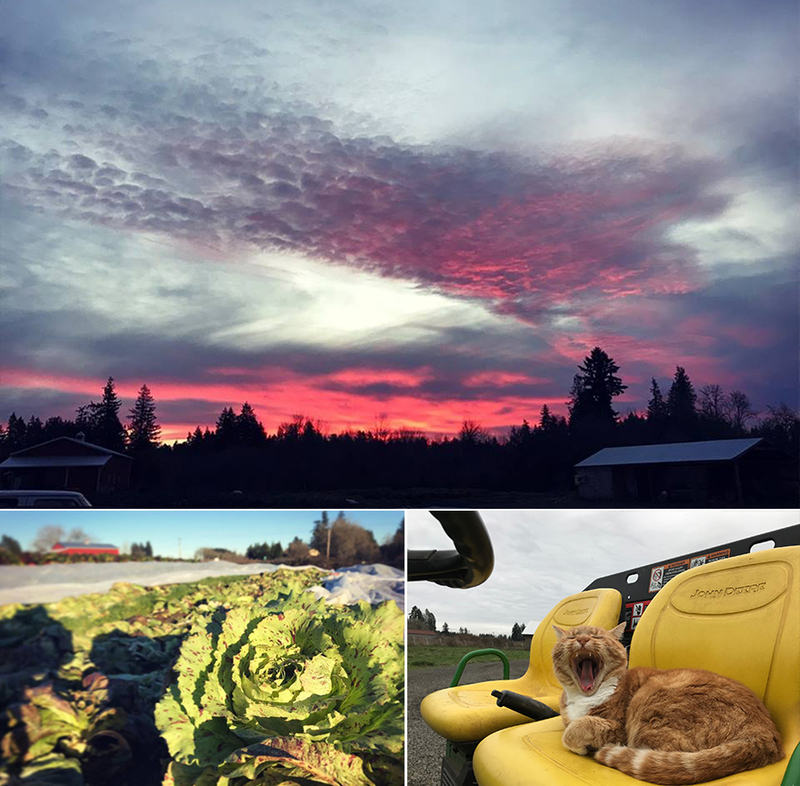 2019 is off to a great start and we want to thank you, our amazing CSA members! 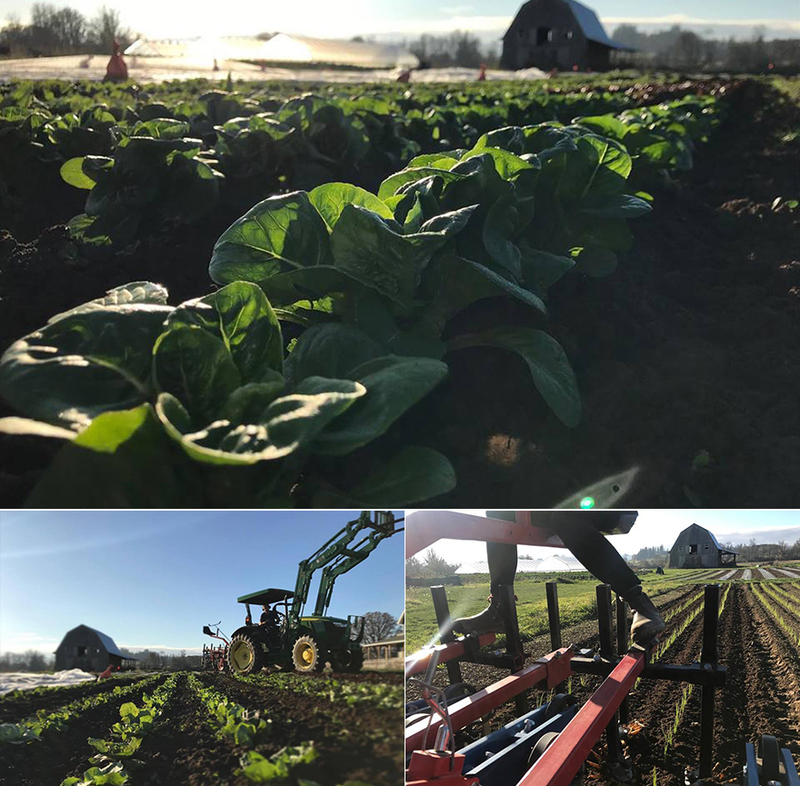 January 1st, 2019 was the best opening CSA day we’ve had in the last 10 years! We had more return members sign up on the 1st (and the days following) than we could have ever expected. Your early investment makes a huge difference in our ability to make decisions on the farm. And those decisions ultimately allow us to provide a better experience and product to you, our members. Here we grow 2019! January on the Farm. It’s a funny in between time on the farm this time of year. Where we’re still subject to winter weather and whatever ol’ mother nature brings our way (with rain, temps falling below freezing etc) but we’re also creeping closer to Spring with every passing day. We’re not planting or seeding or weeding much this time of the year but we are crop planning, preparing, ordering seeds and getting our work spaces and tools in order for a whole new farming season. We’ve been making some major headway on crop planning and seed orders in the WHF office (first we had to dust off all the cobwebs from our 2018 season…farmers don’t see much ‘office’ time during the growing season). We plan on taking several soil tests in the next few weeks to see where our soil fertility is at. We’ve had a blast figuring out soil interpretation over the past 9 seasons and even help out a few of our farmer friends with their soil interpretations. 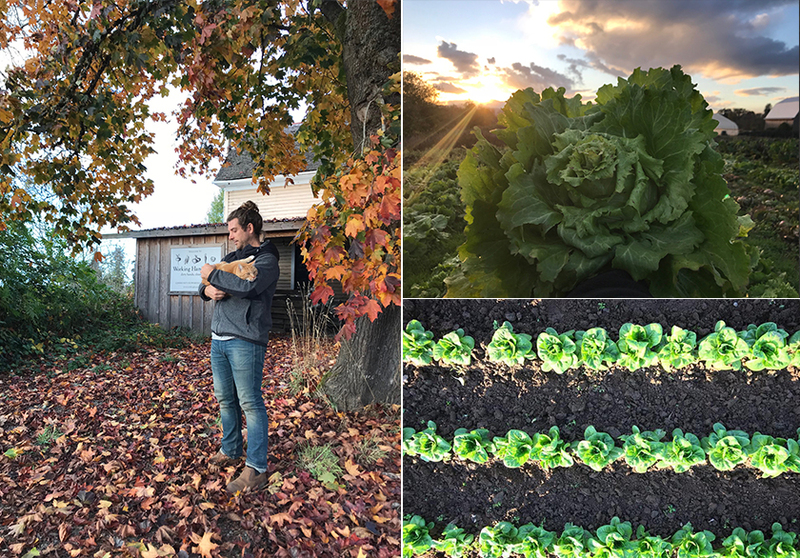 We saw a lot of improvements in our soil last year from all our inputs we’ve put in (organic fertilizer and organic compost etc) and are excited (in the best, most nerdy way possible) to check out how we did this past year! We’ve been crossing off big projects on our list left and right! 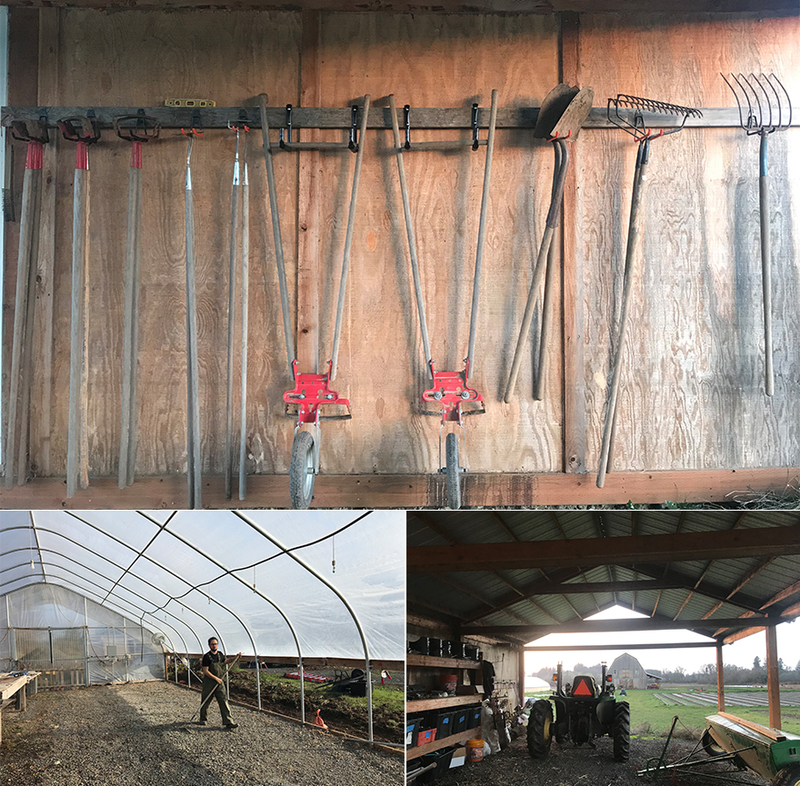 Last month we started our mission to lean-up the farm by organizing all the things on the farm so that everything that we need and has value has a place and anyone could find it if they needed to (think: LEAN Manufacturing). We started in our propagation house (where are the little seedling starts live) and moved on to our tool shed. After identifying the things we need and value, we started identifying things that are no longer needed or don’t add value. I think I mentioned in last month’s newsletter that Rob discovered just how many little things (literally) there are in farming while cleaning out the tool shed… all the tools, and gadgets, equipment and pieces and parts…. we’re like our very own hardware store. There’s so much to organize and manage! Over the two week holiday harvest break Brian got his organization on in the red barn and made a tool bench, employee area, a shelf with labeled bins, hung up our white boards (finally!) as well as leaning out the storage loft. Last weekend, farmer B took on the big undertaking of start the big wood barn clean out. Its primary use the last few years was with livestock so there was deep bedding and heavy cattle panels to remove, fencing, old tools and odds and ends mixed with the veggie equipment we use now etc. There were a few items that made it into the no longer needed items and will hang out in a designated spot for a little bit and make the final decision to sell, give away etc. Sunrise in January, the ‘winter rose’ castelfranco chicory is a workhouse and keeps us eating salads all winter long, glou in his favorite nap spot..
Brian and Rob continued to push this big wood barn project through this past week – Brian said that it was really hard because the harder they looked the more little things they found. The only way out is through! But everything looks good and is coming along! Having more organized rediscovered covered space is amazing. We look forward to seeing how it transforms over the next year! Meanwhile, I’ve been making big progress on the seed order (almost finished! 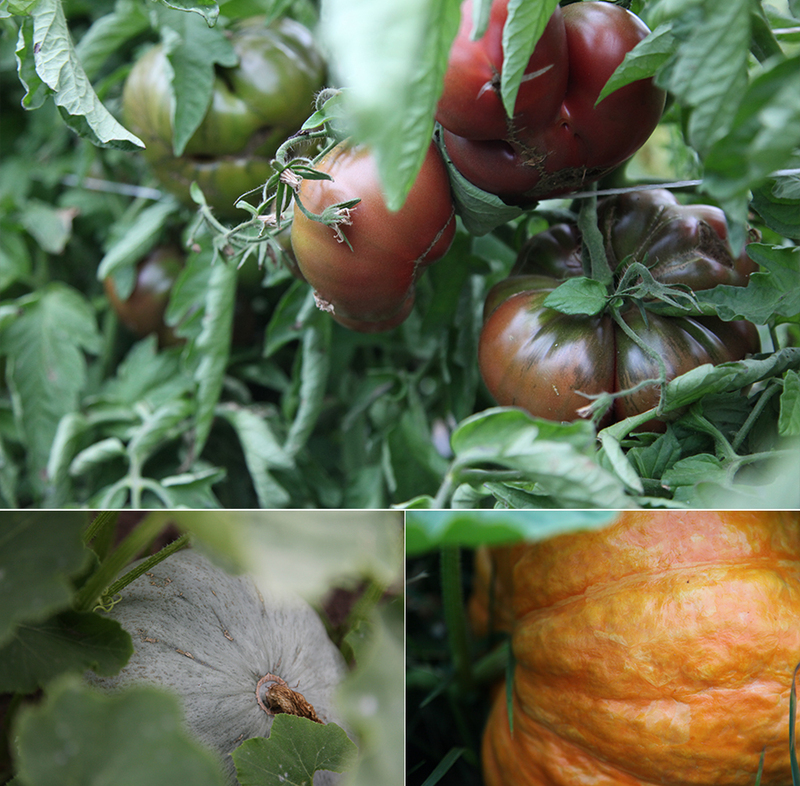 ), crop planning and office stuff as well as harvesting and setting up for the winter CSA! Brian and Rob also took down the tomato trellises from last season – we prefer to wait so that the ground isn’t so dry and the plants have completely died down. They also dug out several stubborn blackberries along the northern edge of one of our high tunnels in preparation to re-skin it (aka put a new poly piece on top!). The original one is still on there and it’s held up pretty darn well for 6 years (they normally only last 3 or so seasons). Feels good to continue to check things off the list. It’s not all work though! We’ve been taking advantage of the shorter daylight hours to catch up with friends, family and fellow farmers. The whole work – life balance can be tough on the farm since it’s all intertwined especially in peak season (summer!) but our priorities are shifting and becoming more balanced now that the farm can potentially/is starting to operate beyond just Brian and I. Systems and organization help with all of this. In early February Brian and I are heading to an Organic Farmer Conference for a few days which is cool because last year Brian stayed back to do Winter CSA! . I’m really looking forward to hearing different perspectives from other farmers and to go on a few hikes in the woods with fellow farmer friends. It will be a nice refresher as we gear up to Spring into Action! We’ve also passed the shortest day of the year (the winter solstice) and are slowly seeing the days increase, minute by minute, day by day. We’ve had a few colder nights over the past few weeks (coldest night got down around 27) but we’ve been maintaining a similar weather pattern of 45-50 degree days and 30-38 degree nights. And after 2017’s crazy winter weather events we’ll take it! Hard to believe we had a foot of snow on the ground that year! It’s amazing how different the years can be. We thank all our Winter CSA members for your support and dedication to winter eating (even through the dark and frozen days of winter). Pretty soon it will be Spring again and the return of longer days and an incredible bounty. We are VERY excited for the coming season on the farm. Winter can be a time of rest and recuperation for farmers but it is also a time for planning, revisiting notes from the previous year, solidifying the crop plan, ordering soil amendments, getting the propagation house up and going for the start of seeding, submitting the seed order, going over financial projections, figuring out ways to manage workflow in the busy season better etc, as well as some winter projects & planting outside. Over the next week we will sow our first seeds of the season (onions, shallots, lettuce, spinach, beets) and this week, we’re buttoning up the rest of our seed order and are in the midst of our crop plan in anticipation of another bountiful season! 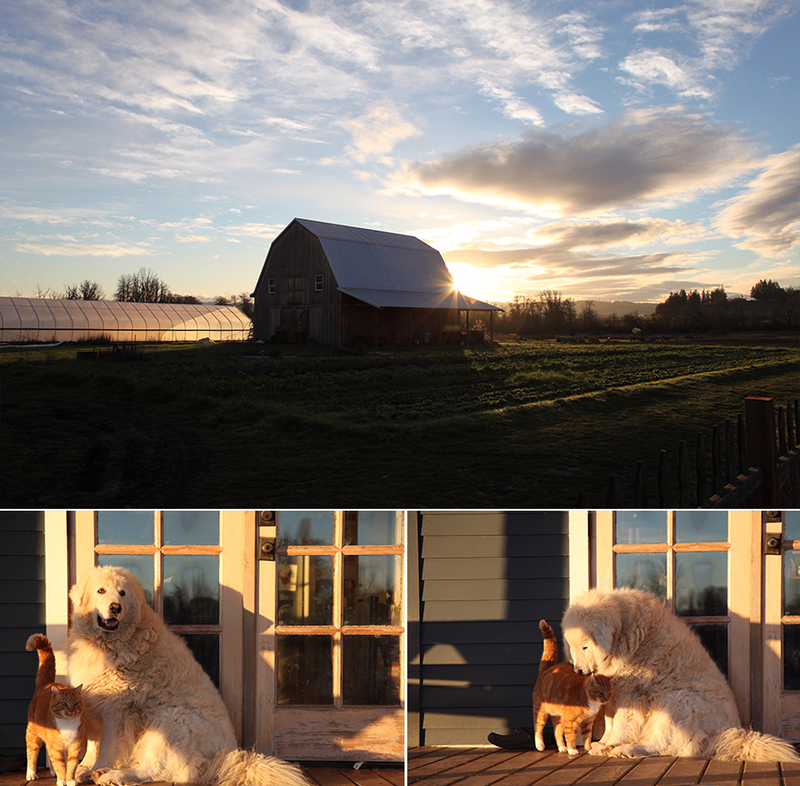 Winter morning light after a freeze, seed cat-a-log coma in the office and visiting our friends new home on their farm! This kind of thing means the world to us. This is why we started WHF, with the goal of bringing a community together over amazing food and to know the farmers and place that brings that food to your table.. to be part of the farm-ily and the working hands farm team. Eating and enjoying that amazing food and tending-to and growing that food through sustainable and organic practices helps us to achieve those goals together! Eating should feel good and when it’s fresh and grown down the road and picked by your farmers it seems like the easiest and best way to contribute to that shared goal/vision. It’s the perfect partnership and we feel so lucky to be where we are in the U.S., in Oregon, in Hillsboro, off an old country road called River within a community of people who are excited to eat well (the freshest possible produce), know their farmers (and their food), support their local economy and be part of the WHF team. Last week’s CSA share room is looking well stocked in January! Spring, Summer & Fall CSA Sign-Ups are now OPEN! 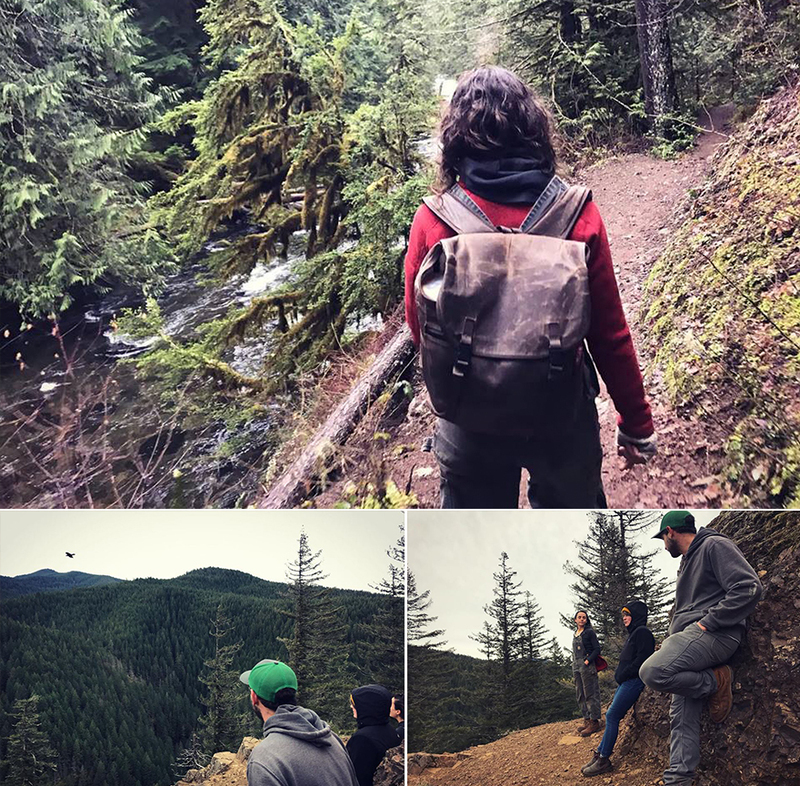 Went for a wonderful hike in Welches with new farmer friends last weekend! Happy Winter Solstice & Happy Holidays to you all! We hope the beginning of December has treated you all well and that you all enjoyed making many delicious homemade meals in the warmth of your kitchen. 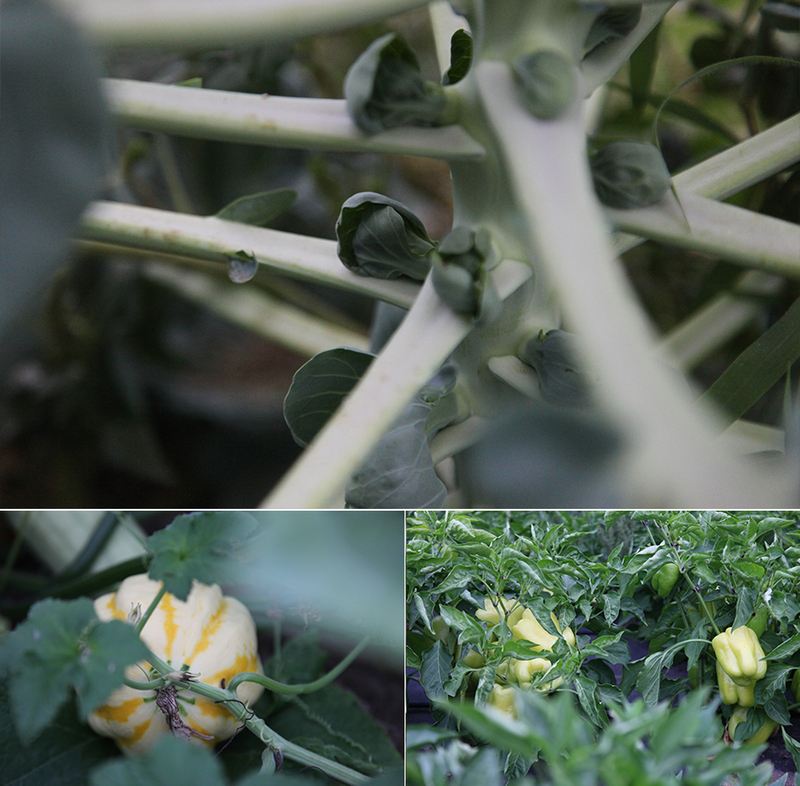 So far, the late fall and early winter weather has been fairly mild and favorable for growing winter veggies! NOAA has been a predicting an “el nino” winter for us through next March as the sea surface temperatures continue to warm bringing warmer drier conditions for the PNW. The recent rains have improved our drought conditions though we still remain in a “severe drought” . On average our nights have been somewhere in the high 30’s/low 40’s with only a few nights in the mid-low 20’s in early December. We’ve also had a few wind storms roll through and our creek/bottom area flooded out just a little but all of this is to be expected (some years it’s been way crazier… freezing rain, snow, the Tualatin river flooding etc). It’s our 4th season growing through the winter months and it definitely helps to have all that experience under our belts as we gain confidence and are better suited to make decisions when we get an unexpected storm, cold front, flood etc. 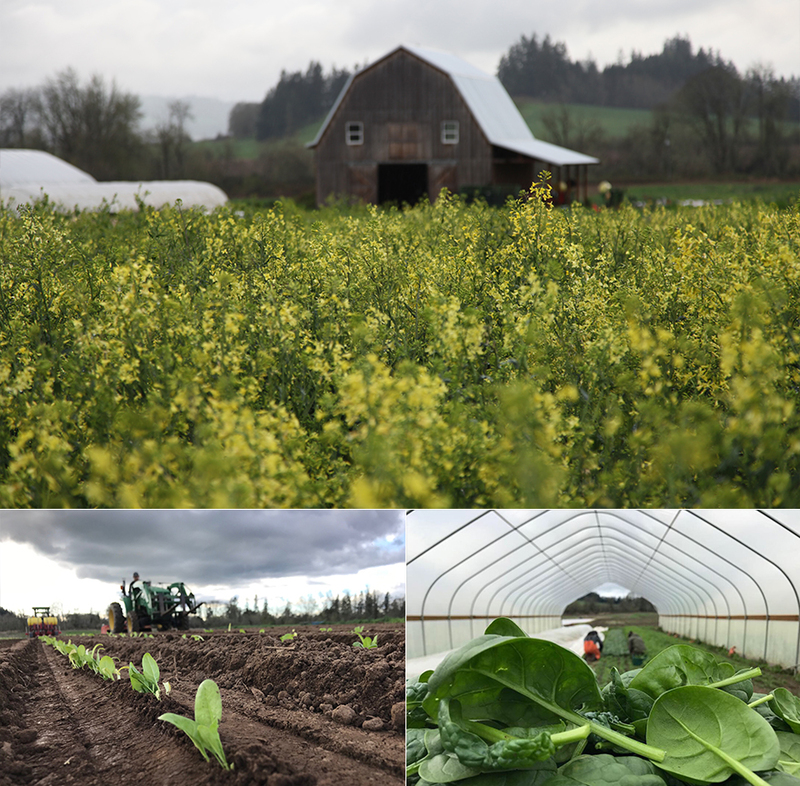 There’s no better place to grow (in our humble opinion) during the winter months than in the Willamette Valley – our more mild oceanic/marine west coast climate is perfect for overwintering vegetables and when you pair that with a couple of farmers who love growing vegetables it’s a winning combination. For those of you who are joining us for a winter growing season we think you are the bees knees. You understand that the winter weather is more variable than other times of the year and you have chosen to support the farm and these two farmers through the winter months. Crop losses can happen from a hard freeze, disease pressure, bugs, etc… and many of these things will be out of your farmers control. You invest in the farm and the farmers and we do our very best to provide you with organic seasonal produce that is sure to inspire. We have taken measures to give the Winter CSA the best possible chance at success like building high tunnels, building a pole barn for storage, researching specialty winter hardy crops, etc… All that being said, you have gotten to know Brian and I, and our work ethic over the course of this season (and for the majority of you over several seasons) and you know we will do our very best to ensure you have food on your table all winter long! Thank you for supporting our farm through all the seasons! We’re so thankful for the season’s bounty and for our member’s support year after year. The one thing that rings true when it comes to our produce and our farm is the assurance of knowing how and where it was grown and who grew and harvested it. There’s accountability and trust and community. 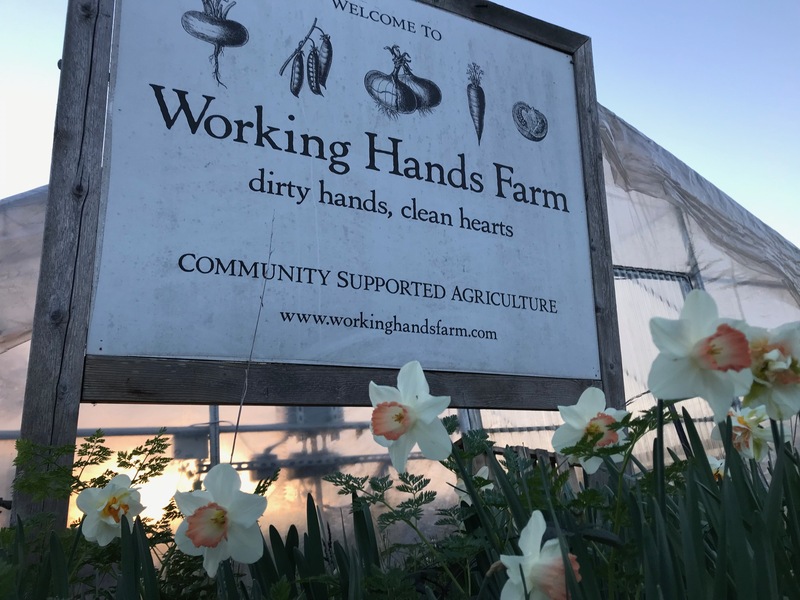 Everything we sell is grown here at Working Hands Farm. From the field to the barn it’s only been a matter of hours before our customers pick it up. We see a lot of different companies produce boxes popping up in our social media feed and although they do have their merits (people eating and having access to produce is important!) they don’t have what we do.. Truly knowing your farmer and knowing what farm it comes from, how it was produced, how it was harvested fresh and handled and stored and who is harvesting it. And the fact that it’s only gone a few thousand feet or less from farm to consumer! Thank you for supporting your local farm and economy! We look forward to growing for you all in 2019 and in the years ahead! We grow better each and every year with the support, encouragement and inspiration that our CSA members bring. It’s a mutual admiration society around here. This time of the year that quote, “there’s no such thing as bad weather, only the wrong clothes” rings true. It’s a different kind of farming in the winter – in the summer we depend on the cooler hours of the day and in the winter we harvest and gather in the waning days with many cozy layers that keep us protected and dry. We’ve managed to bulk harvest a lot of winter veggies and have a few more crops we plan to get in over the next few weeks (i.e. those ridiculously sweet carrots that we’ve been calling ‘candy carrots’, beets, cabbage etc). Since it’s been such a mild late fall and winter we’ve continued to harvest a lot of crops for the Winter CSA that don’t do well in the super cold (under 25*) i.e. fully mature romanesco, cauliflower, broccoli, fennel, celery which all turn into slime- from freezing and thawing- and withering away. 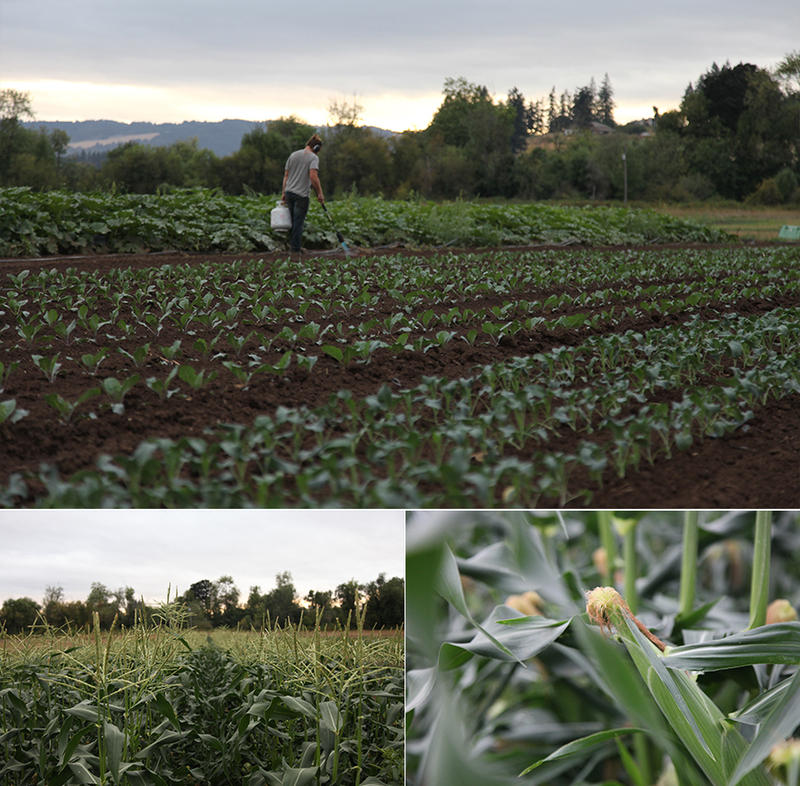 So that’s been pretty fun to have those crops to include in the CSA shares! Some of the crops we grow actually taste better when they go through a freeze (turnips, carrots, parsnips, rutabaga, kale, cabbage, kohlrabi, etc) because of all the sugar they create in order to protect themselves from freezing. 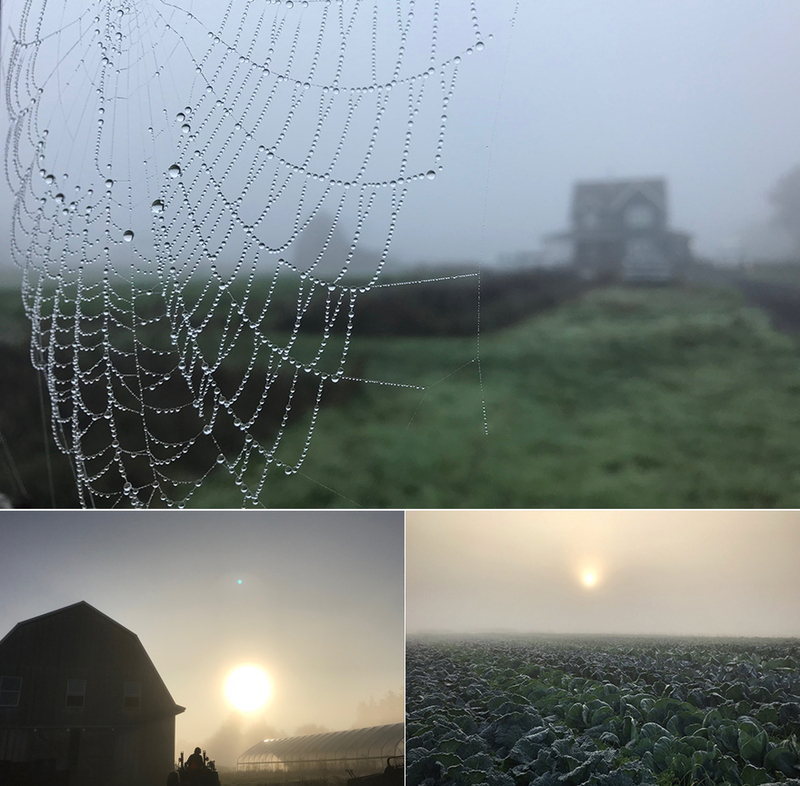 To find a balance and to protect some of the more tender crops listed above, before any cold and bitter weather hits we are keeping busy, covering crops, harvesting in bulk for storage and working extra hard to ensure that our winter CSA members have the best possible CSA experience. We’re crossing things off the winter project list with the help of our employee Rob! We’ve also made some major headway on a few projects so far this month! Rob, our part time employee is also here through the winter months for a few days a week helping out with projects and bulk harvests! While I chiseled away at the CSA Brian and Rob were able to get a few key projects done in the last few weeks: the first – cleaning out and laying weed barrier mat down in our propagation greenhouse. This is really important to help maintain and keep a sterile environment as we start all our seedlings here! Over the years we’ve had some blackberries, morning glory, thistle etc move its way in so they weeded it all and laid down the mat. It looks great in there and we can’t wait to get our first seeds of the season started in January! 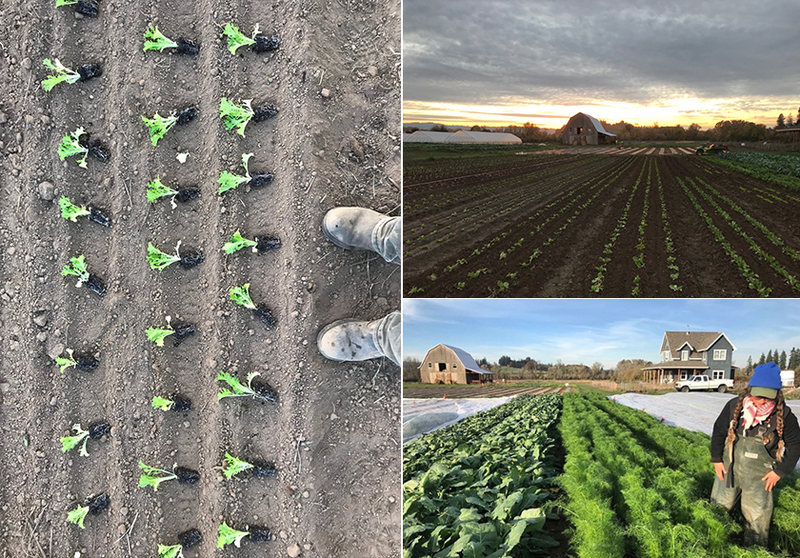 Another week they took down debris leftover in a few of our high tunnels and cleared them out for winter transplants (the first crops of late winter 2019 will be coming out of here). Brian will be spreading compost in there in the coming days and tilling/prepping some seed beds for planting. They also spent HOURS covering some of our more tender crops with row cover topped with sandbags (50ft x 200ft.. you can imagine the size!) to protect the crops from the cold when we had a few nights in the 20’s. And just this past week Rob made some huge headway on organizing our tool shed. Farmer Brian helped him finish it up and get everything tucked away for the start of the new season. A little pre-Spring cleaning cleaning. Feels so good to have things reorganized! We’ve been listening to a few of Jean Martin Fortier’s (the market gardener) workshops, ideas, plans, etc and have been re-inspired to take a fine tooth comb to our systems and start to organize things on the farm so that everything has a place and anyone could find it if they needed to (think: LEAN Manufacturing). While cleaning out the tool shed I think Rob discovered just how many little things (literally) there are in farming… all the tools, and gadgets, equipment and pieces and parts…. we’re like our very own hardware store. There’s so much to organize and manage! We’re really looking forward to applying this concept more and more over the next year to really get things in ship shape as we welcome more aspiring young farmers to work on our crew and set it up for a successful long haul! We feel really lucky to be farmers and have a successful small farm and now we are looking forward to being a farm where others can have success and careers too! Winter CSA has been bountiful and delicious! We look forward to seeing what’s ahead in the coming months! The Winter Solstice marks the shortest day of the year! On the solstice it will be close to 8 hours & 42min (compared to the Summer Solstice with 15 hours & 41 min of daylight). 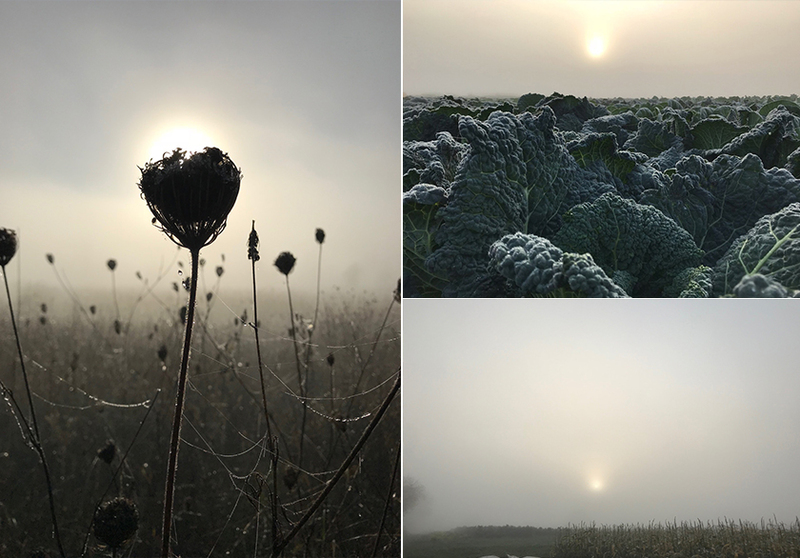 It is during this darkest time of the year (when you have 10hours of daylight or less) — referred to by Eliot Coleman as the “Persephone period” — that plant growth essentially stops… we’re already getting excited for the longer days ahead! ‘Rosalba’ Radicchio stealing the show out in the field and Gloucester soaking up the sun after the storm. 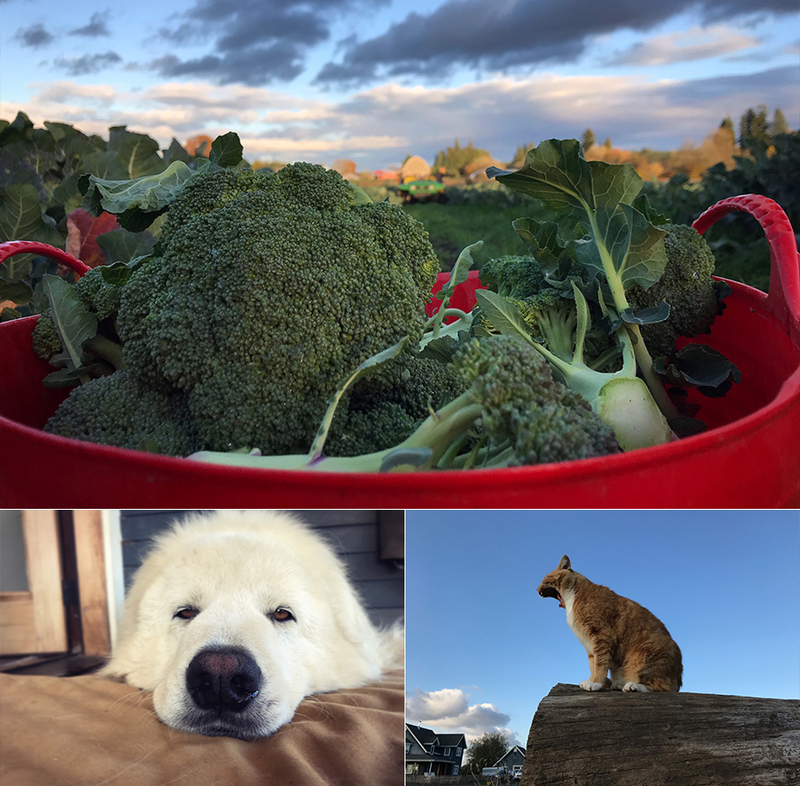 Aside from growing winter veggies, we’re just plugging along on the winter projects… cleaning up around the farm, planting for late winter/early spring, harvesting, organizing, building projects, packing and storing, planning, making financial projections for next season etc. We’re still chippin’ away at the ol’ to-do list but we’re also taking time to rest and recuperate (thanks to the growing darkness that winter brings). 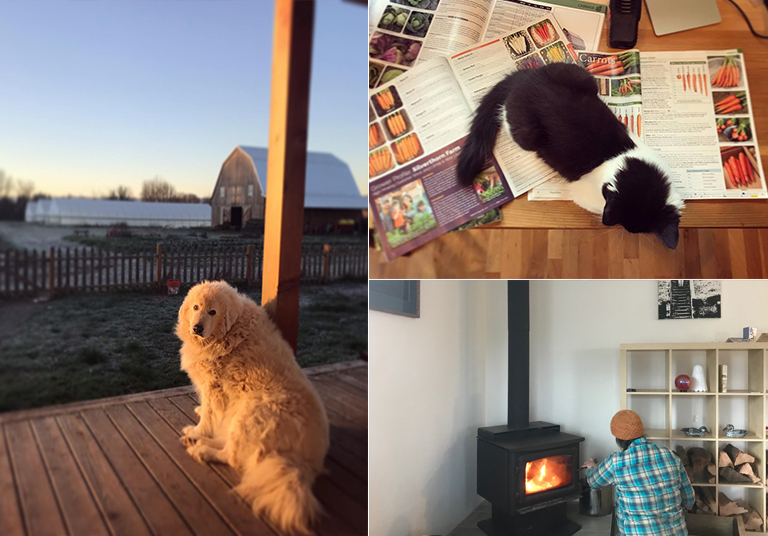 As we near the holidays and the new year we’ll be spending the longer evenings inside, brainstorming and dreaming about the future and pulling out all of our inspiring seed catalogs to begin our adventure for the 2019 season! Mark your calendars for January 1st CSA Sign Ups! January marks the beginning of our season as we open up registration for the main season CSA, order our seeds, fill the propagation greenhouse with soil amendments, and begin this exciting process all over again! 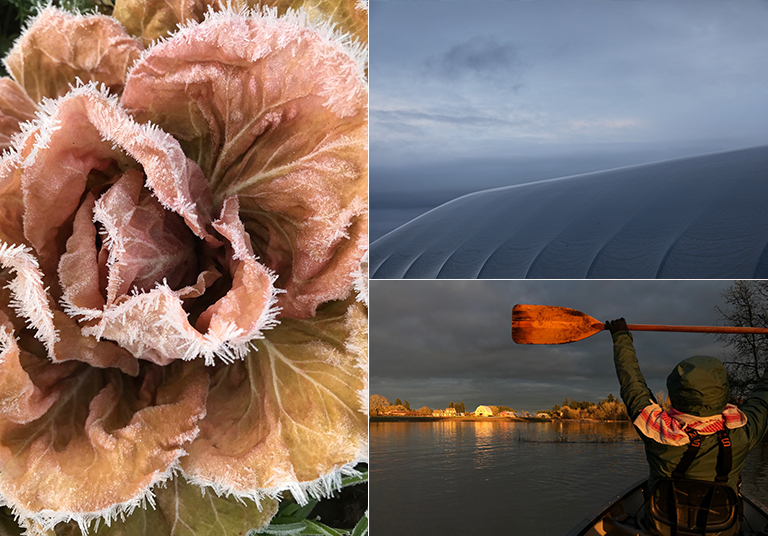 We have some exciting plans and ideas to make 2019 our greatest growing season yet – so stay tuned! Happy Holidays! We’ll see you all in the New Year!